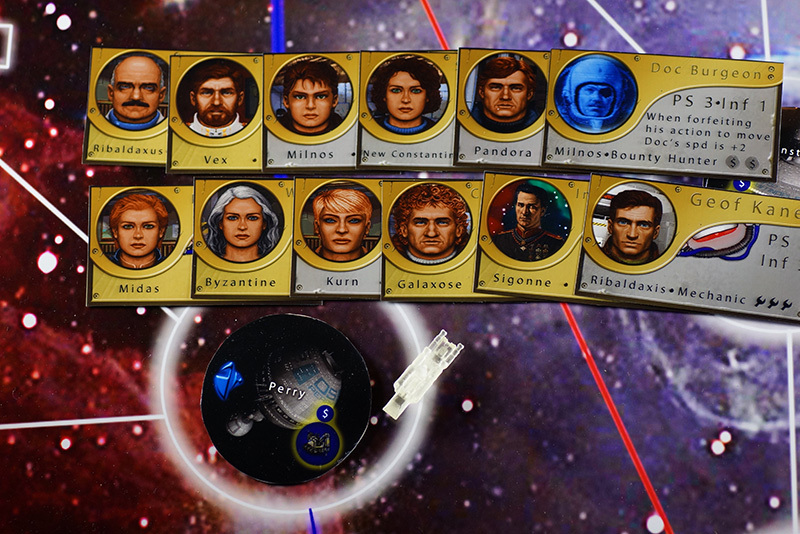 Development work on capi's spirited RPG campaign Vespus is starting to wrap up. Over the last couple of months he's made good progress on its missions. There's even some interesting electronic warfare stuff going on involving a Zartoth. 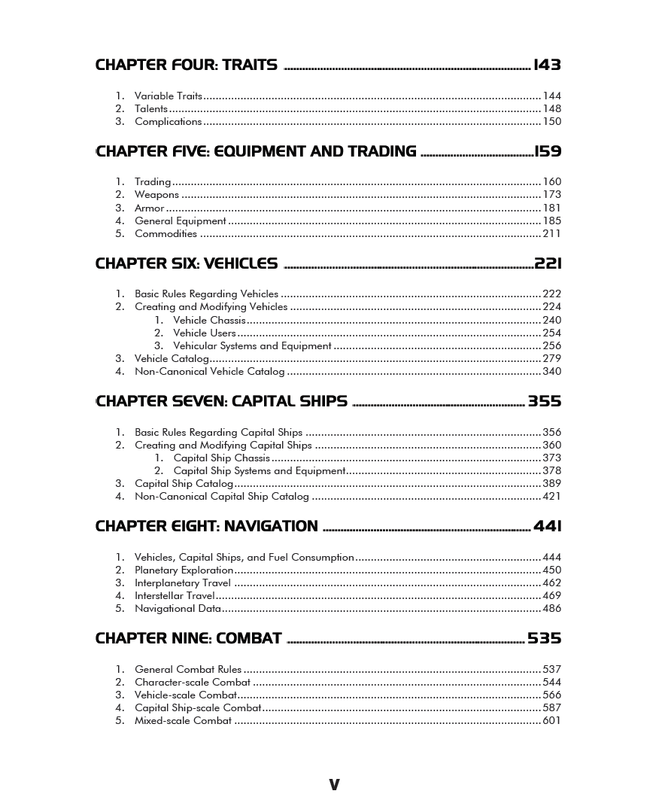 After a few finishing touches, it's just on to proofreading and then fans will be able to play for themselves. As the story concludes for this adventure, capi is also wondering what the next theme campaign should be about. 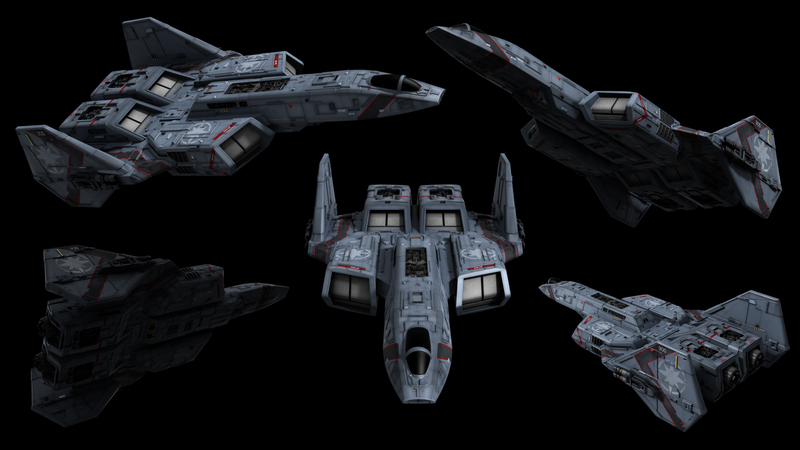 He's got several diverse options including the events of Pilgrim Stars/Truth, a dedicated Bearcat squadron, a Kilrathi mission and possible ground combat involving marines. You can vote on your favorite at the CIC Forums here. 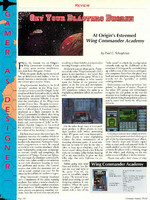 You can also learn more about capi's Wing Commander RPG here or here. Anyway, as I mentioned in today's update I'm beginning to give some thoughts as to what I want to do as far as the next campaign goes. I've got four ideas of my own and I can't decide on which one I should do next, so I've decided to open it up to the opinion of the CIC community - what should I do next? I'll probably leave this poll open until I get a good sample. The only thing I ask is that if you do respond with "Something else" that you give me a suggestion; it doesn't have to be a good one, just something that you'd like to see. 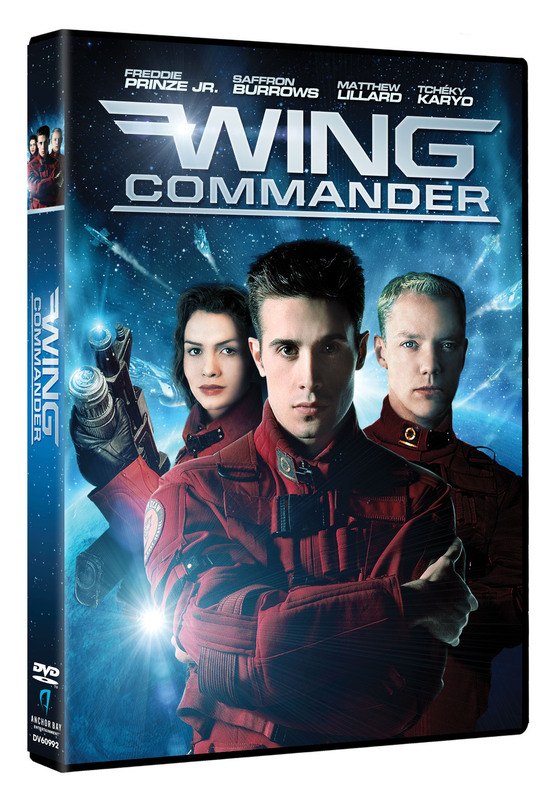 We're now just one week away from the anticipated release of Wing Commander on Blu-ray! Although some places still suggest an August 13 street date, most places seem to be holding firm to August 6. Fans who've preordered at Amazon with release date delivery will know for sure if they get a shipping notification in a few more days. Kris did some digging and found an interesting quote from 2002. During a Q&A with Fox, a dedicated Wingnut asked about additional releases of the Wing Commander Movie. The Fox rep completely ruled out any future version. Not only did we get a new DVD in 2011, but we're finally on the verge of the retail HD release! 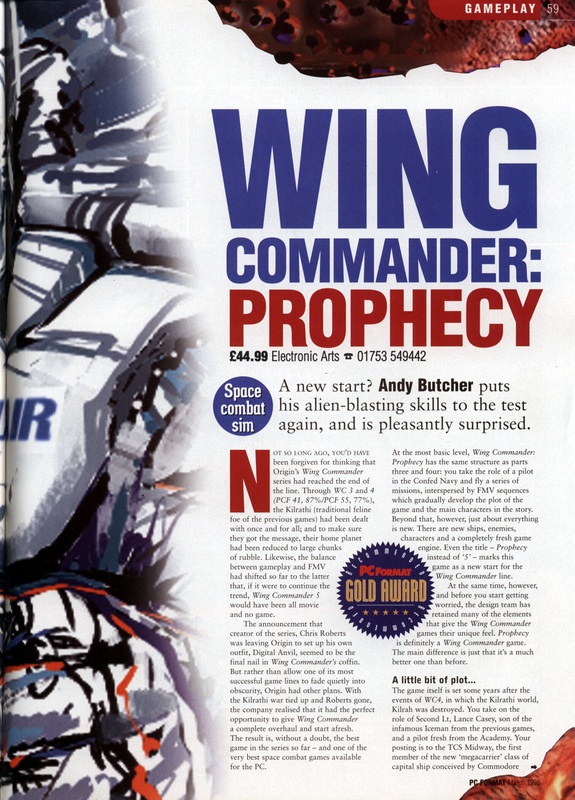 That just goes to show... never bet against Wing Commander! Anchor Bay has posted the angled Blu-ray box cover, so we've also got another new high res shot below. 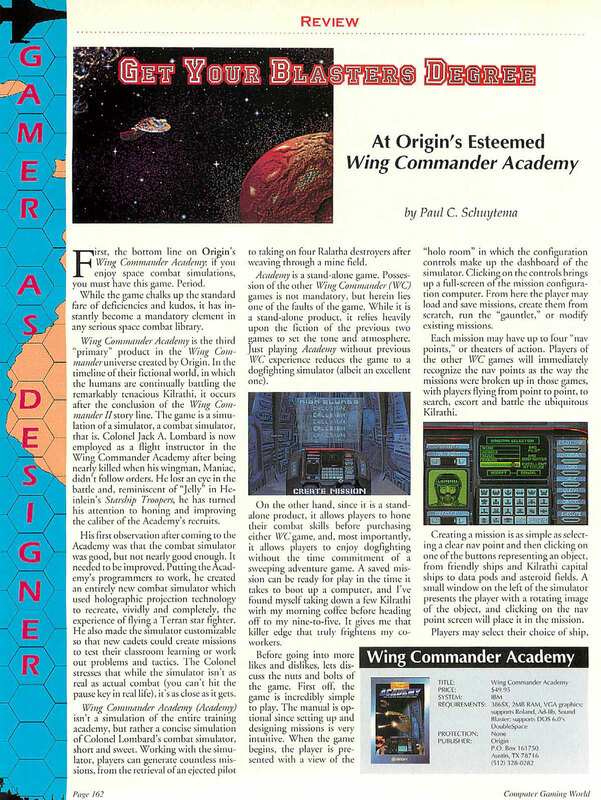 Forums member Falcon988 came across an old review of Wing Commander I in the December 1990 issue of Computer Gaming World. 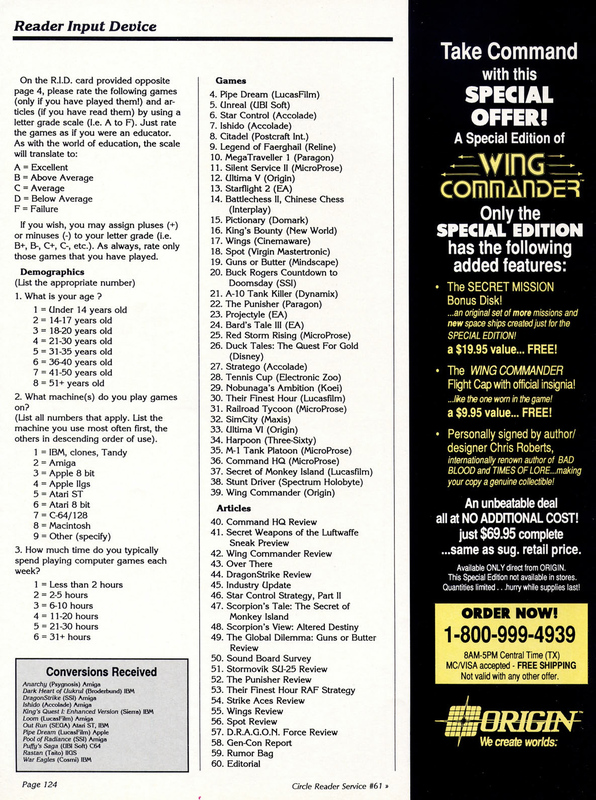 The magazine also contained a time-limited special offer if you purchased Wing Commander directly from Origin. 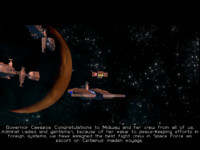 At no extra cost, you also received the Secret Missions expansion pack, a flight cap and a copy of the original game signed by Chris Roberts himself. 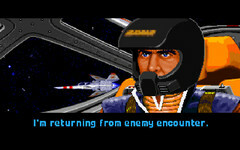 The original Wing Commander hat has since become quite a collector's item! 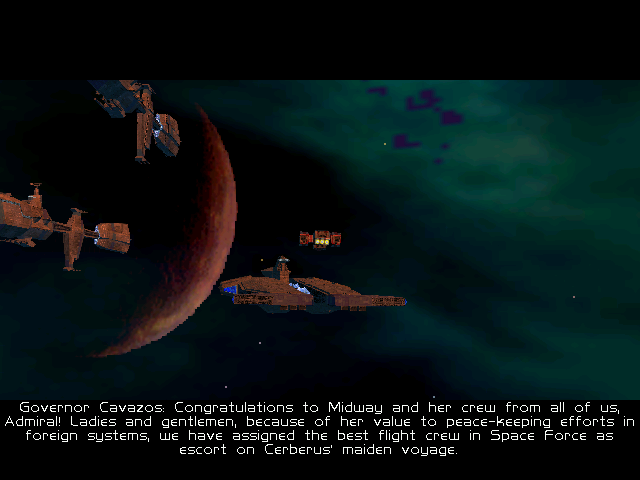 One of the interesting features in Wing Commander is its fictional "campaign". 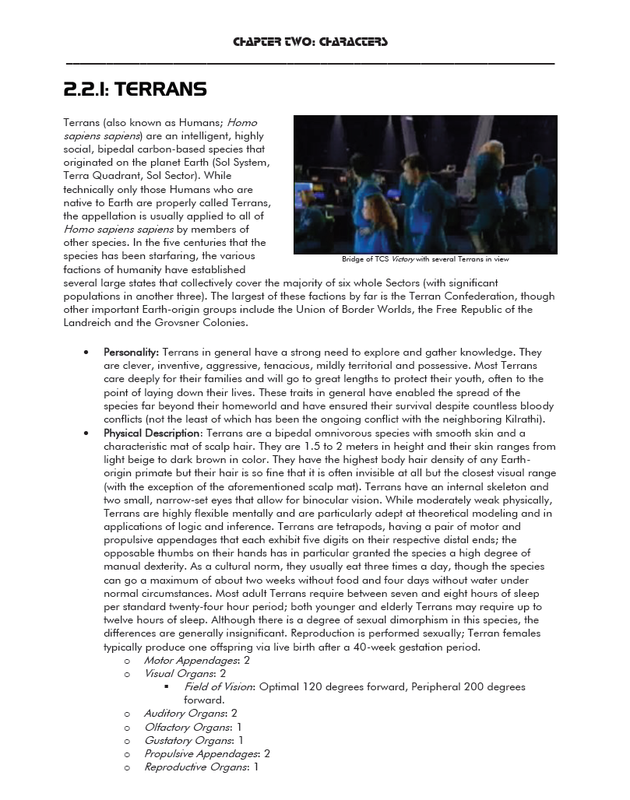 The strategic map of Terran- and Kilrathi-controlled space gives players a solid visual frame of reference for where the battles are taking place and how close they are to the heart of the empires in conflict. This "strategic situation" is an important element in the game. Which star the Tiger Claw [sic] settles at determines the nature of the missions which the player conduct there. Are there friendly bases there to protect or enemy ones to attack? Is this a major jump point which must be secured? 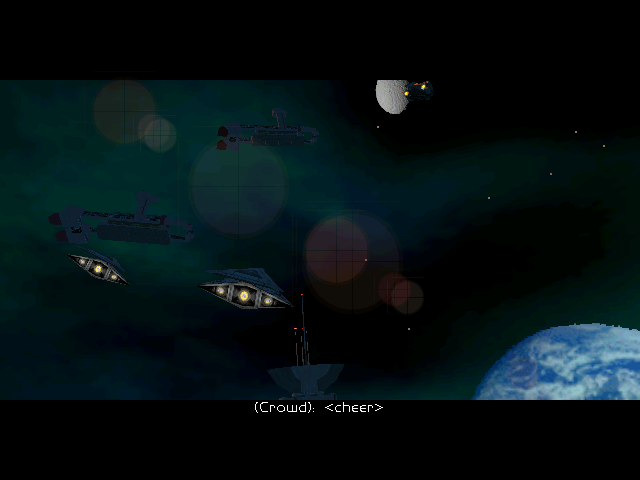 The significance of one's strategic location is described at two locations in the game: in the bar (as the player garners the latest scuttlebutt) and in the briefing room (where the missions are assigned). 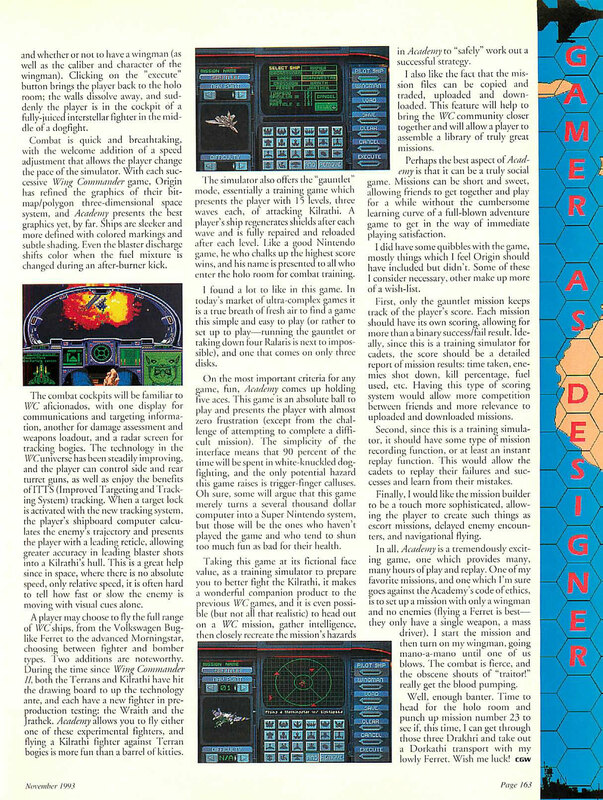 This issue of Computer Gaming World also contains a preview for Secret Weapons of the Luftwaffe, gameplay tips for Star Control and reviews for SU-25 and D.R.A.G.O.N. Force. Check it out here. Update made possible by the excellent CGW Museum. Bonus material! 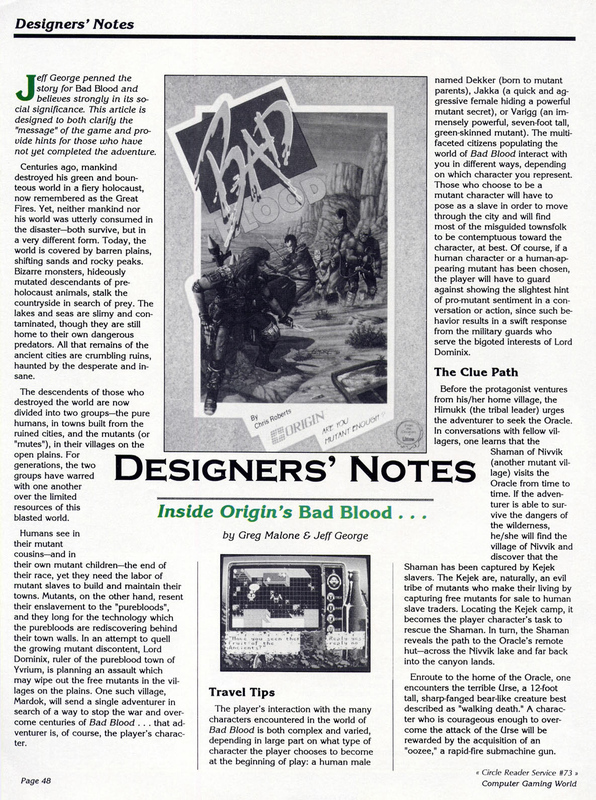 In addition to a glowing review of the original Wing Commander game, the December '90 issue of Computer Gaming World also contains beautiful full page ads for Chris Roberts' role playing title Bad Blood and Worlds of Ultima: The Savage Empire. 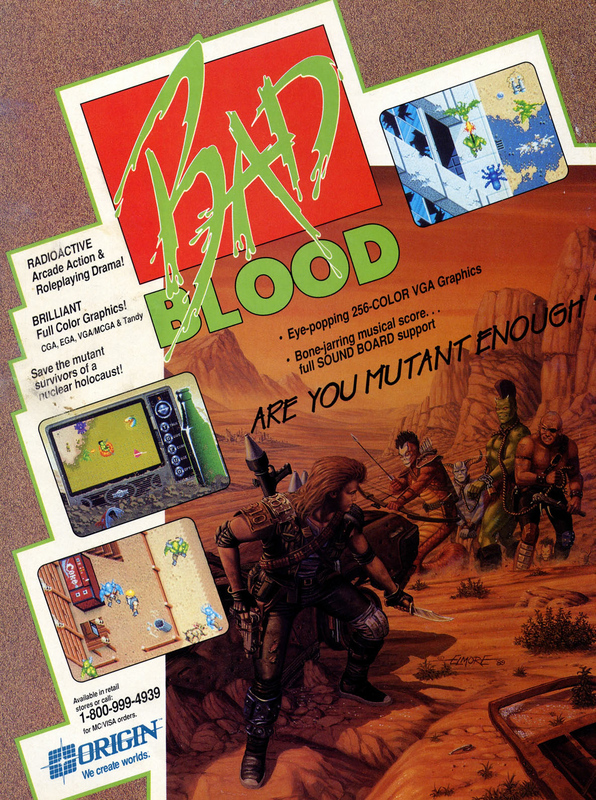 There is also a piece with insights from Bad Blood's screenplay writer and game designer, Jeff George. Thanks again to CGW Museum for making this update possible. 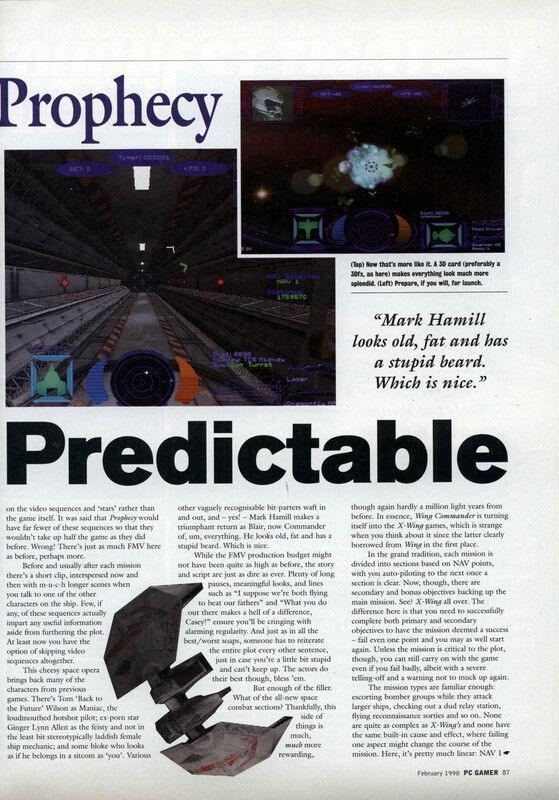 Next in our series of old Prophecy reviews is PC Gamer's. 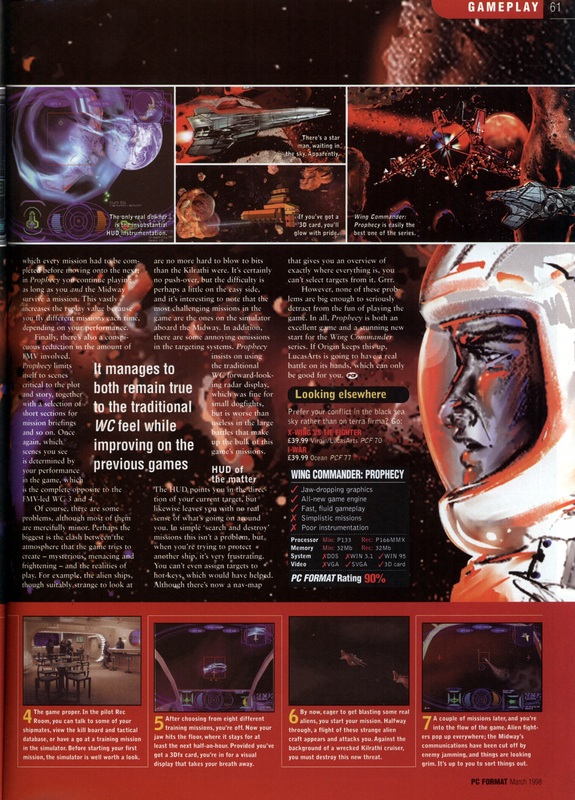 The reviewer praises the upgraded graphics that run smoothly even without 3D acceleration (some people didn't have one, or they had a chipset that was unsupported) and Syd Mead's alien design work. Negatives are that it's too similar to the previous games in the series and not enough of a leap forward. The final score is just under 80% and the bottom line is that Prophecy is "better than WC4, but not by much." 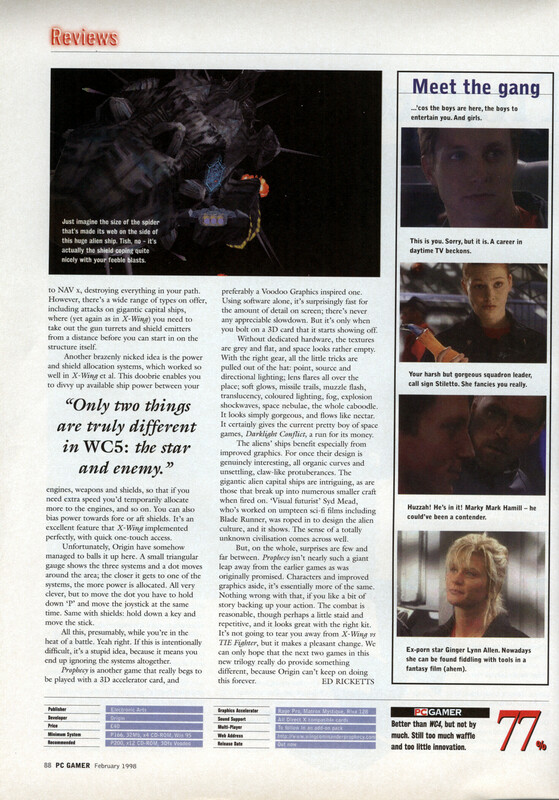 Once again thanks to Pix's Origin Adventures for these great scans! 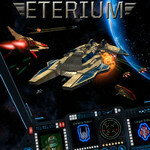 Longtime visitor Andrew Luby is still plugging away at his Wing Commander inspired space sim Eterium. If you don't see the WC roots, just check out that familiar looking logo graphic! 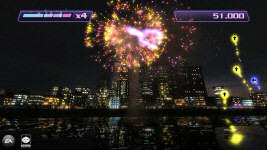 Since we first covered the game, development seems to have shifted from XNA (Xbox and Windows) to just Windows for PC. A crowdfunding campaign will wrap up at the end of the month. They now have a playable demo available that shows off improved graphics and lighting effects and better game engine performance. 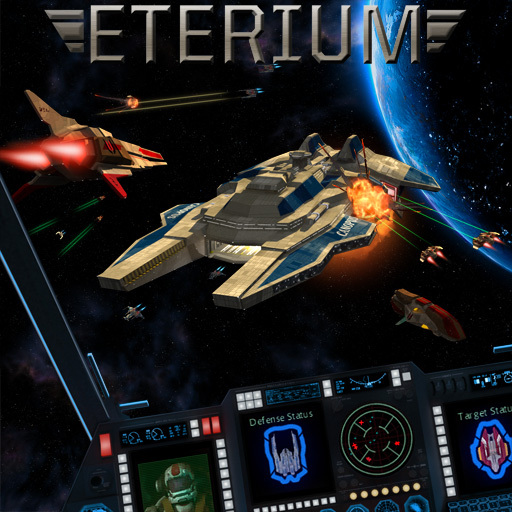 You can also see the game in action on Eterium's YouTube channel. 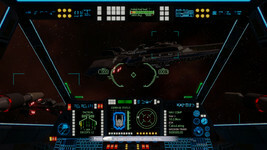 As a big fan of space sim games, I've been waiting many years for a Wing Commander or X-Wing style game to come along! 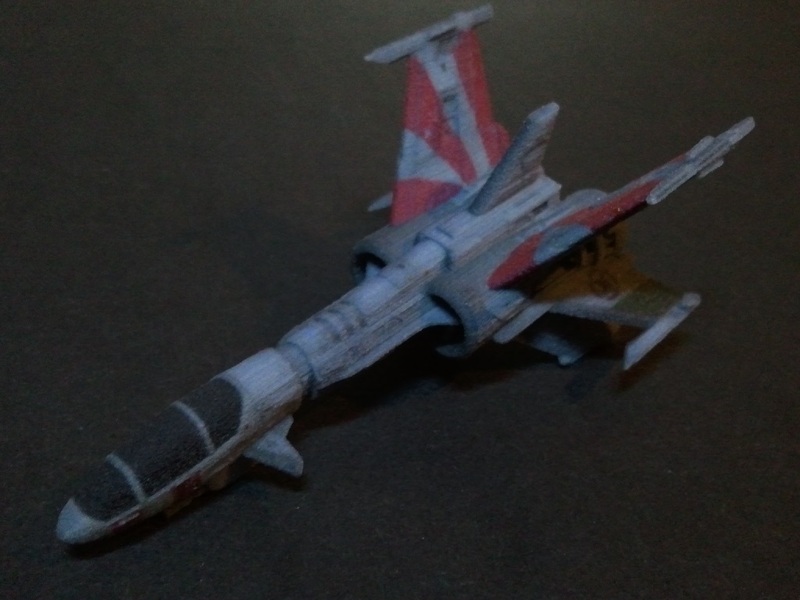 I miss the days of hanging out in the rec room and talking to my wingmen before flying a mission. I don't really care much for the economy sim aspect, such as commodity trading and ship purchasing, that has found its way into many modern space sims. 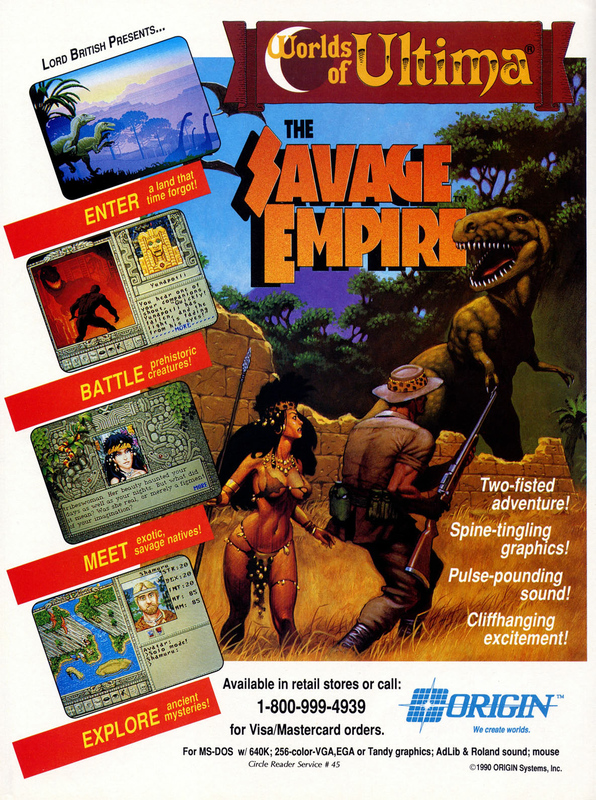 Neither am I satisfied with arcade-style games at the other extreme. 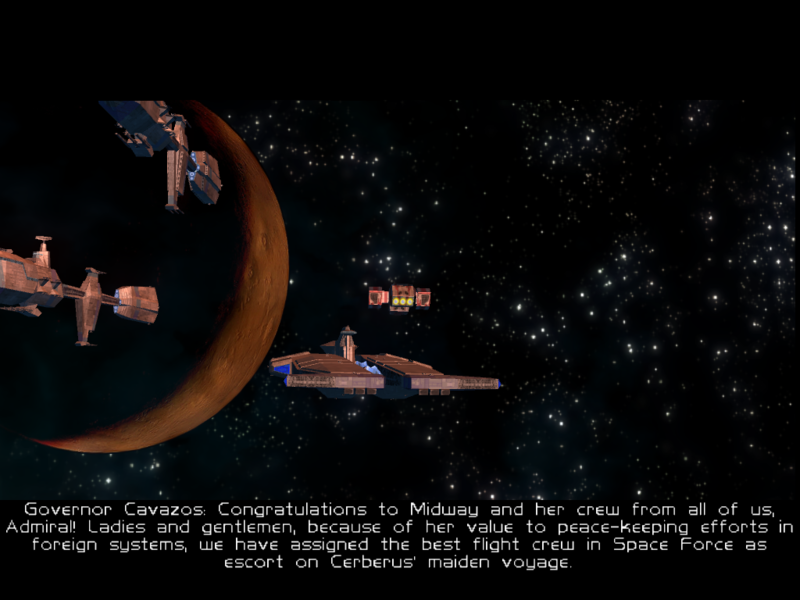 I was looking for a story-driven game that concentrated on being a pilot and part of something larger than myself. 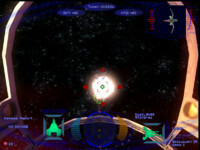 I realized that if I was going to play a modern version of the classic space sim, I would have to create it myself. Two Weeks Until the Birthday Party! The CIC's 15th Birthday Party is now just two weeks away. Join us on Saturday, August 10, 2013 at 7:00 pm EDT (4:00 pm PDT and 11:00 pm GMT, early Sunday morning in Asia/Australia). Since the party is on a Saturday this year, we're excited that many of our Asian and Australian regulars will be able to make it on Sunday morning. 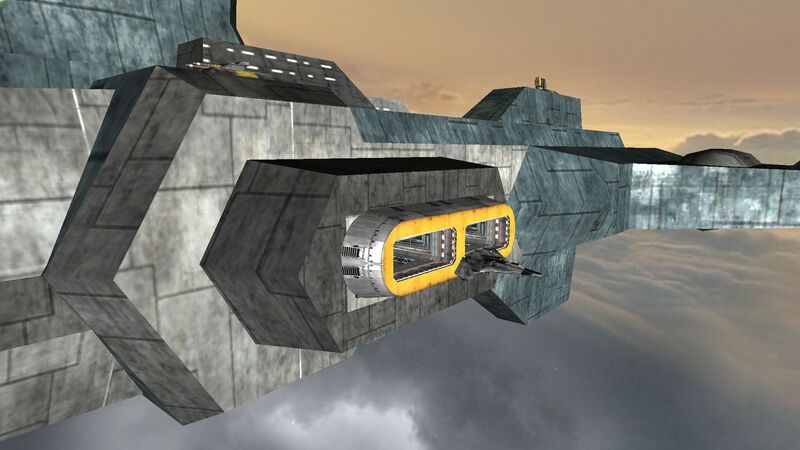 The event will take place in our IRC channel, #Wingnut. Newcomers can easily join through the flash interface and start chatting right away. There'll be trivia contests, giveaways and special CIC features! You can even RSVP and invite your friends via our Facebook page. Naive Rookie Or Hardened Vet? Forum members st3lt3k and Wedge009 pointed us to the November '93 issue of Computer Gaming World. 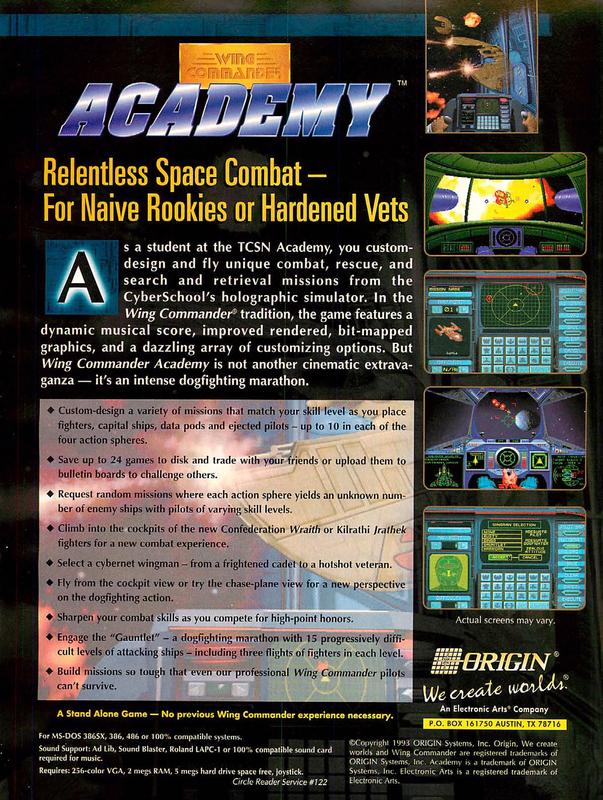 It contains a review of Wing Commander: Academy and full page ads for Academy and Privateer. 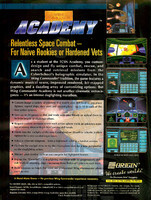 In all, Academy is a tremendously exciting game, one which provides many, many hours of play and replay. One of my favorite missions, and one which I'm sure goes against the Academy's code of ethics, is to set up a mission with only a wingman and no enemies (flying a Ferret is best -- they only have a single weapon, a mass driver). 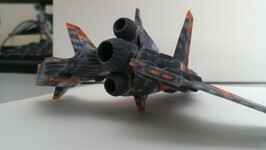 I start the mission and then turn on my wingman, going mano-a-mano until one of us blows. The combat is fierce, and the obscene shouts of "traitor!" really get the blood pumping. Good times. 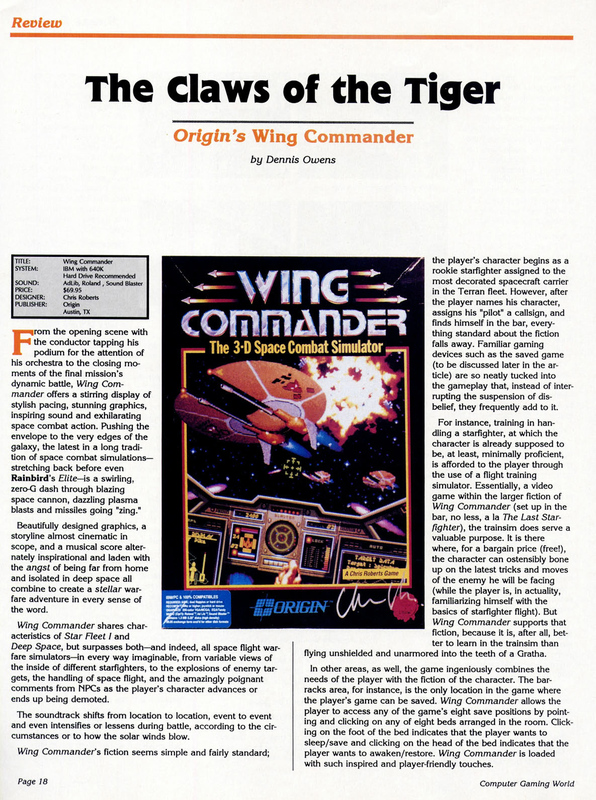 Other highlights from the issue include Gabriel Knight, Lands of Lore and a big article with gameplay tips for Origin's Strike Commander flight sim. Check it out here. Update made possible by the awesome CGW Museum. 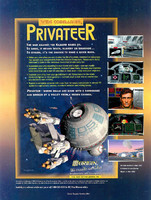 Pix's Origin Adventures has scanned and uploaded several Prophecy reviews from popular 1990s PC gaming magazines. The CIC will be sharing a number of them with you over the next week. 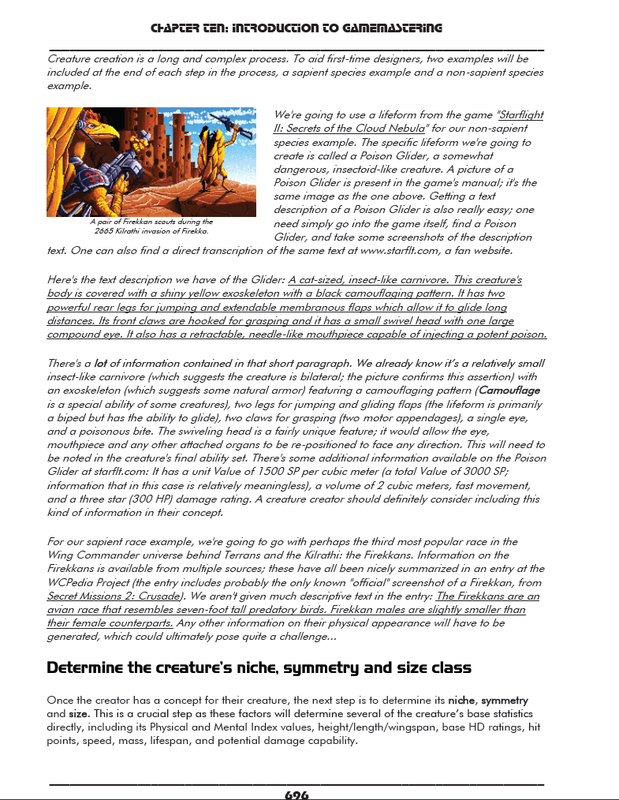 We kick off with the March 1998 issue of PC Format. 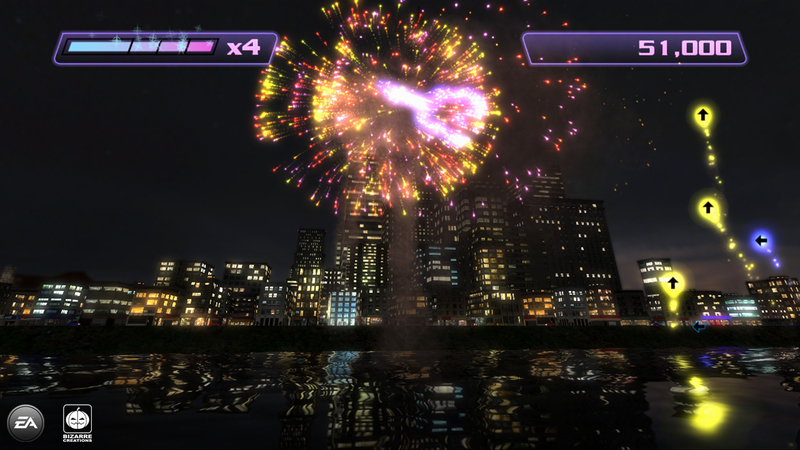 The tone of the review is very positive and the game is praised for the graphics engine and overall gameplay. Astute readers will wonder what the (awesome) background imagery has to do with Prophecy. 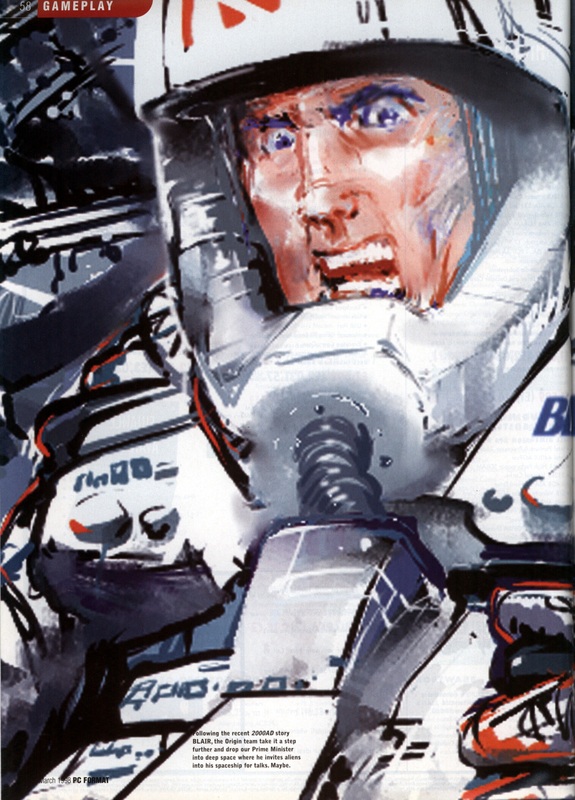 From 1995 onwards, a set of painted storyboards were used to pitch the Wing Commander Movie to movie studios and financiers. These storyboards are often mistakenly believed to be from Prophecy's filmshoot due to them being included on the Prophecy press kit CD's. You can see the full set here. 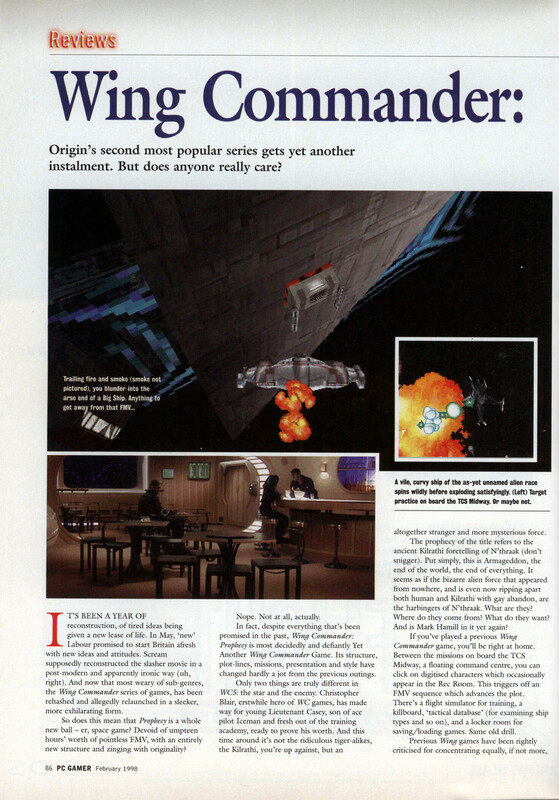 Thanks to Pix's Origin Adventures for these great scans! 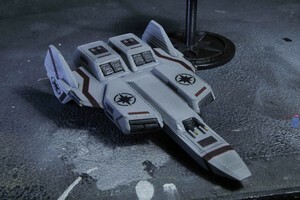 Over the years, there have been a number of long lost 'holy grails' that hung over the Wing Commander community and at one point seemed impossible to track down. Fortunately, thanks to all the hard work of dedicated Wingnuts, few remain lost today! 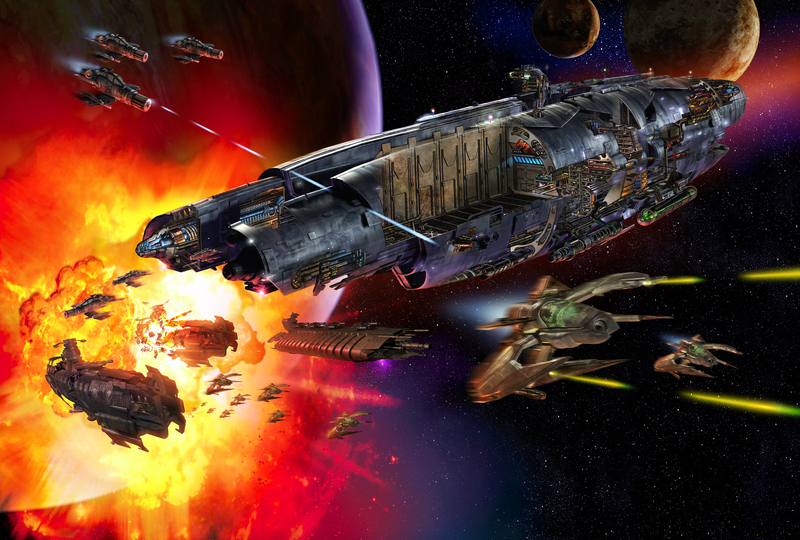 One such treasure is an exquisite cutaway poster of the TCS Tiger's Claw from the Wing Commander Movie. 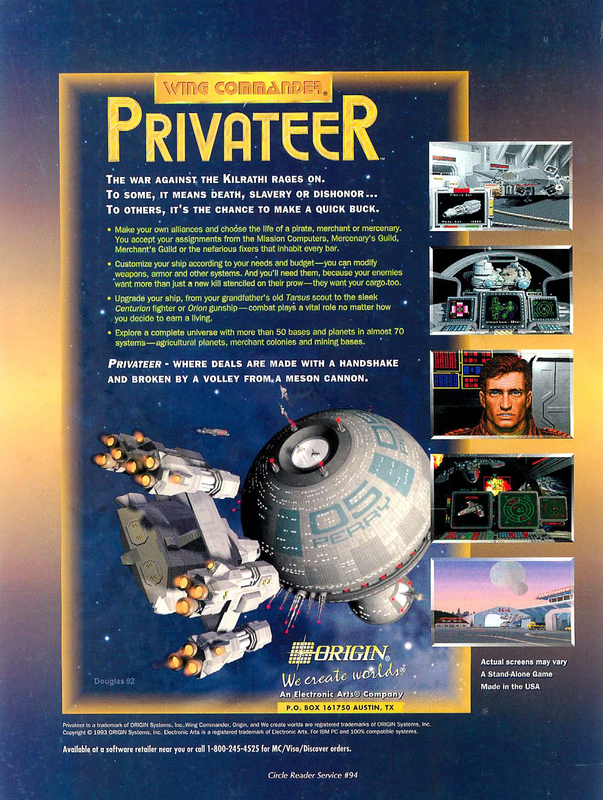 An August 1999 magazine ad revealed its existence, but the item was never published and released. Wingnuts devoted themselves to searching for the poster's origins and where a copy might be found. Over a decade of tireless effort finally struck gold in 2010 when the complete image was found! It's every bit amazing as we dreamed, and since it's been several years since the poster graced our front page, we wanted to make sure you knew about it. Feast your eyes below! 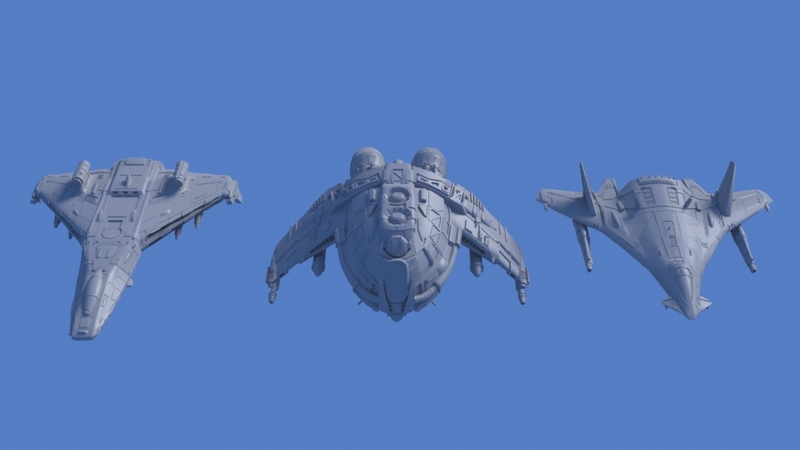 sndwv has posted some more glorious shots of Klavs' 3D printed models. 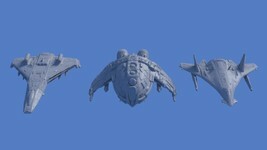 These are the first photographs of the Sabre, Dralthi IV and Epee in the actual sandstone composite. 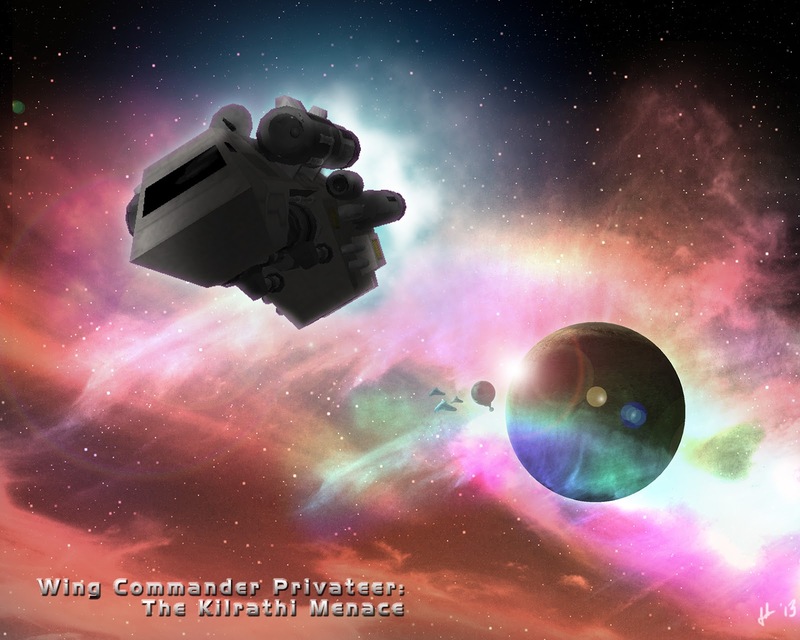 The Kilrathi ship looks positively scary bearing down on a tiny Ferret. The larger Sabre looks dashing as always, and the Epee is even looking particularly svelte. 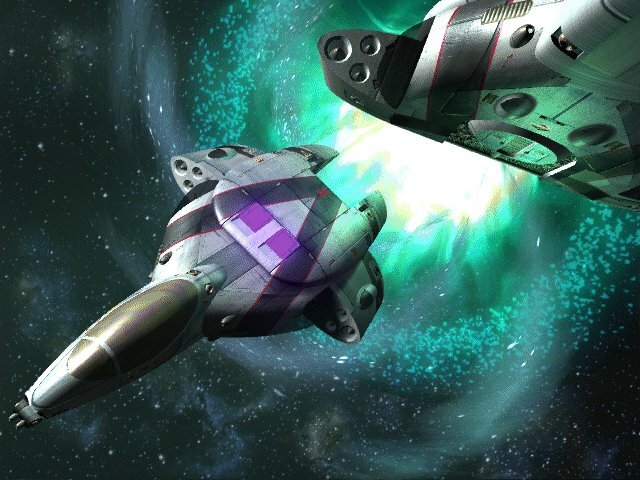 Although the lighting isn't great, there's actually kind of a cool moonglow effect that suggests how the ships might appear flying through space. 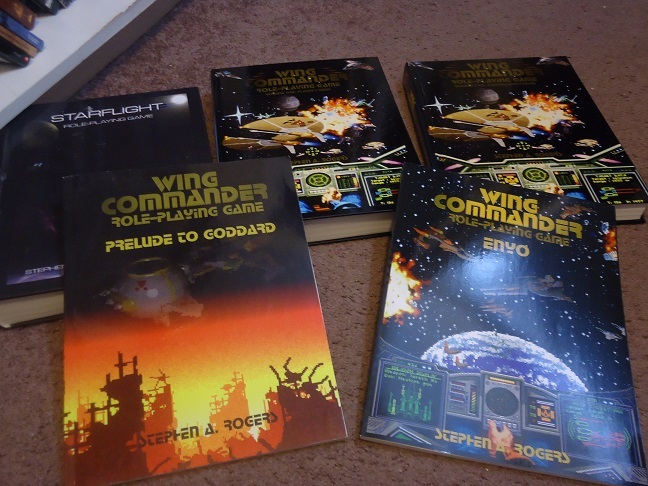 sndwv doesn't have to be the only lucky guy with Wing Commander models all over his desk, you can grab yours at Terran Fleet Supply! Sorry for the bad lighting; not doing the mdels justice, but it's the best I can do at the moment! Roberts Space Industries has been steadily shipping out Star Citizen cards to people who pledged in last year's crowd funding campaign. 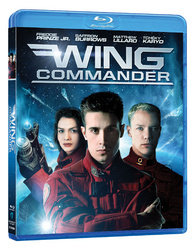 A handful of Wingnuts have gotten theirs inscribed with Wing Commander-themed names. 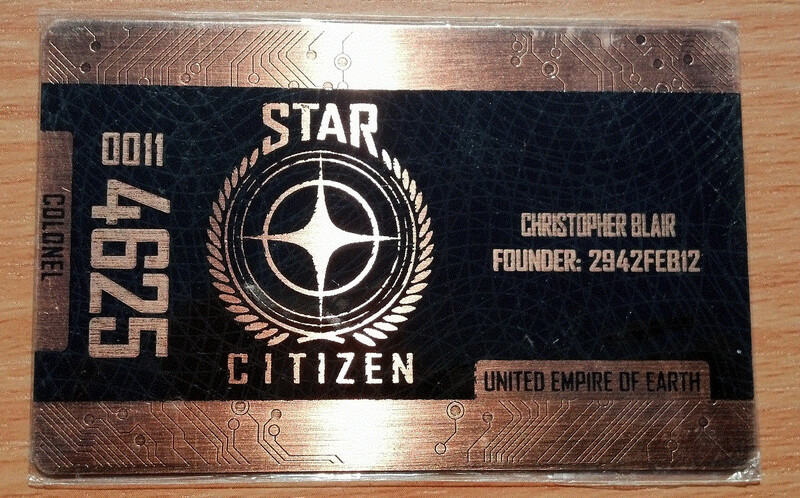 The award for best card goes to Toast, who pledged at the bronze level and therefore received one with the credentials of Colonel Christopher Blair! 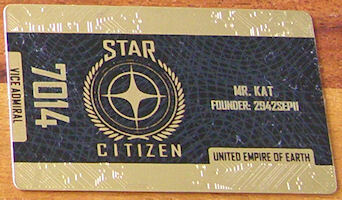 Bob McDob comes in a very close second with a gold Vice Admiral Mr. Kat! 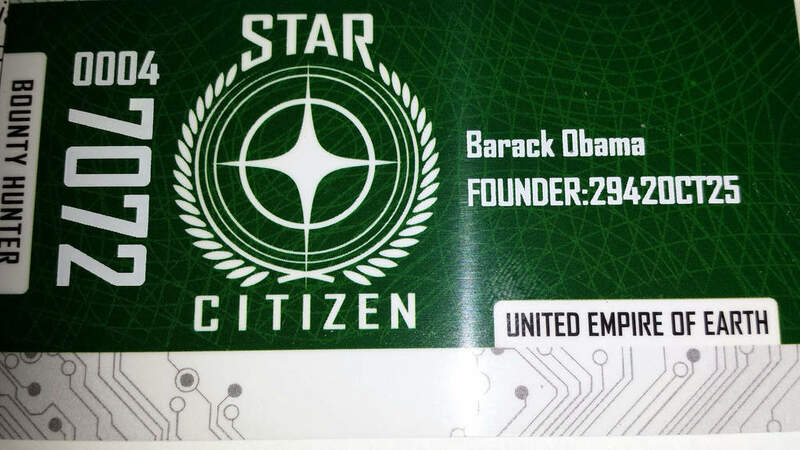 My platinum card is a simple CIC plug, and Tyrranus spotted the green one. 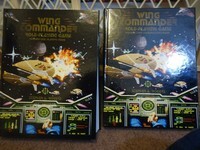 Does anyone else have an awesome Wing Commanderific card to share? If I'd had more money it would have been nice to get a few more, but good 'ol Player 1 was in reach, so there it is! Three Weeks Until the Birthday Party! Less than a month to go! The CIC's 15th Birthday Party is now three weeks away. Join us on Saturday, August 10, 2013 at 7:00 pm EDT (4:00 pm PDT and 11:00 pm GMT, early Sunday morning in Asia/Australia). Everything takes place in our IRC chatroom, #Wingnut. Feel free to stop by any time, but be sure to be there for the big event! If it's your first time, the web interface makes it easy. There'll be lots of fun, competition and excitement that you don't want to miss. Klavs is helping to get things started with this awesome Tiger's Claw graphic. Look closely and you'll see that the ship's crew is ready to join us! Self explanatory! Not every EVA has to be a solemn one! 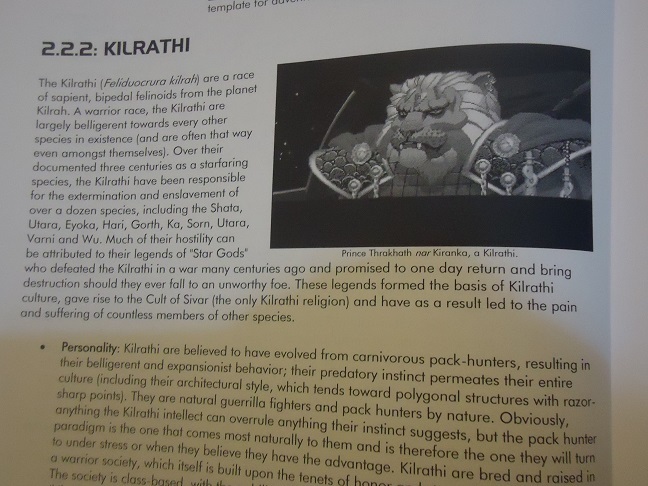 capi has posted some wonderful pictures of his fan made RPG in print. 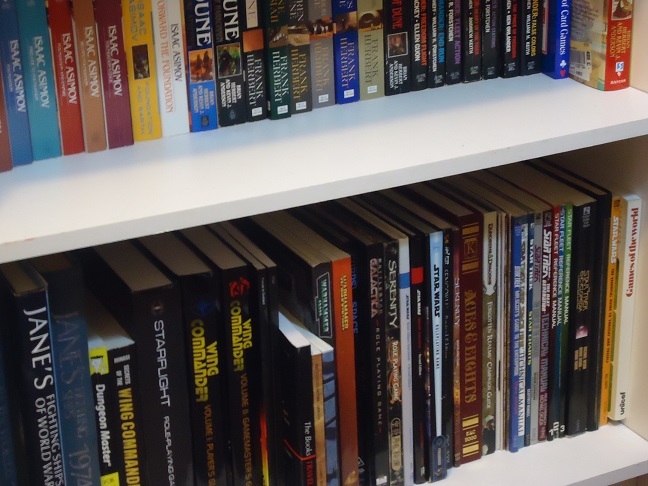 After completing the core RPG in May, hard copies of the Player's Guide and Gamemaster's Guide were made avaible over Lulu. Wing Commander fans are craftier than ever! 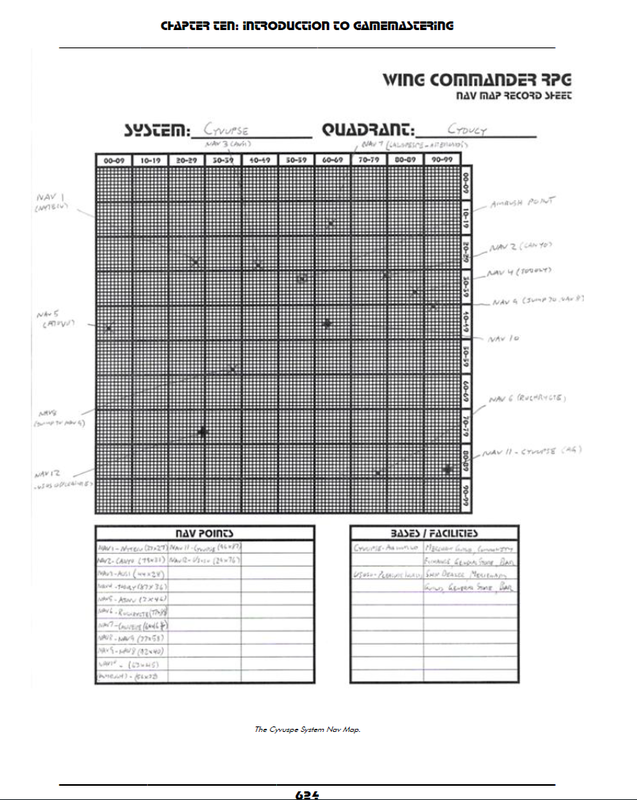 The entire thing can also be downloaded (22 meg PDF) and played without any special material. His older campaigns, Prelude to Goddard and Enyo, are also available. They all look super slick side by side below! Now, these were the first copies, the ones I ordered before I had all the kinks worked out with the covers. 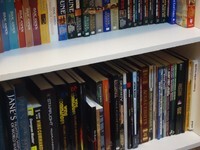 You can see a bit of border on volume one; while that's been corrected with volume two, some of the image got cut off. Volume one still has a visual artifact too that you really can't see in these pics. Trust me it's there. Problems aside, they look beautiful. 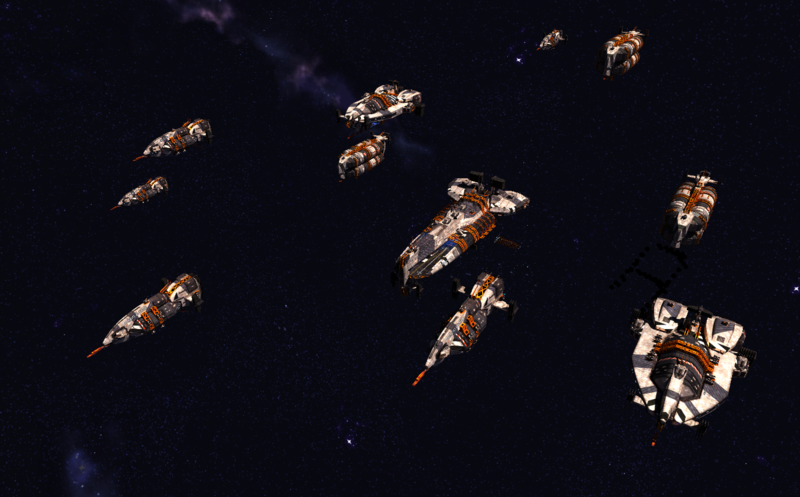 Deathsnake has posted a new picture to show off the latest development in the Last Line of Defense mod. 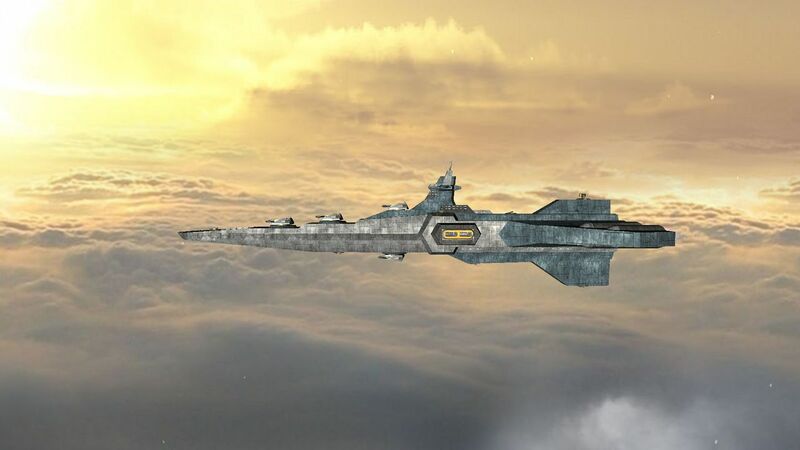 The shot below includes Sabres over a cityscape on a red planet. 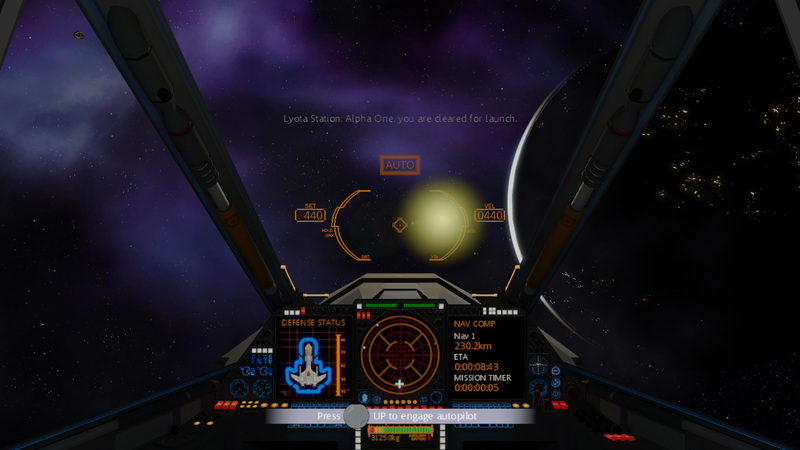 Atmospheric missions are being tested for the game, including possible carrier launches from within the clouds. 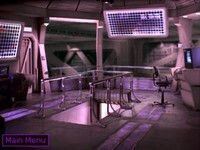 LLoD will revisit familiar locations in the Engima Sector such as Olympus Station and Ghorah Khar! 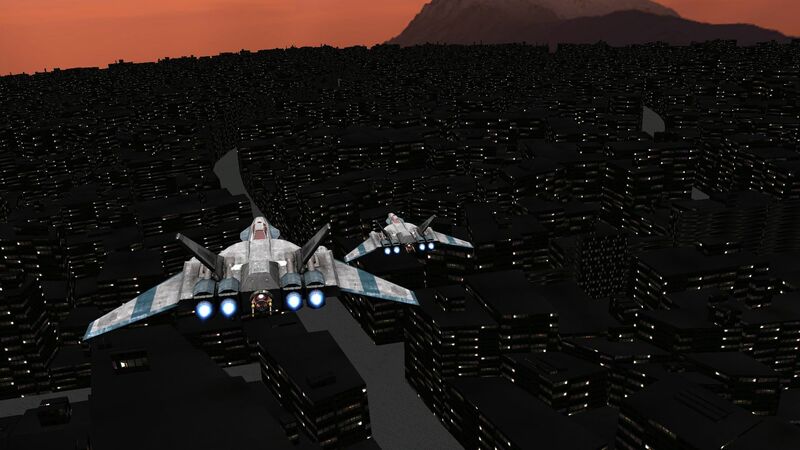 Patrol over City. 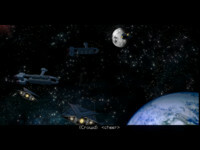 Credits for Citymodel to Darius from the Freespace Modding Team Blue Planet. 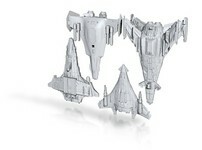 Klavs has put together a neat bundle of small scale Confed fighters in an affordable four-pack. 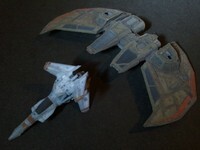 Each is about one to one and a half inches long and is perfect for painted miniature tabletop gaming. 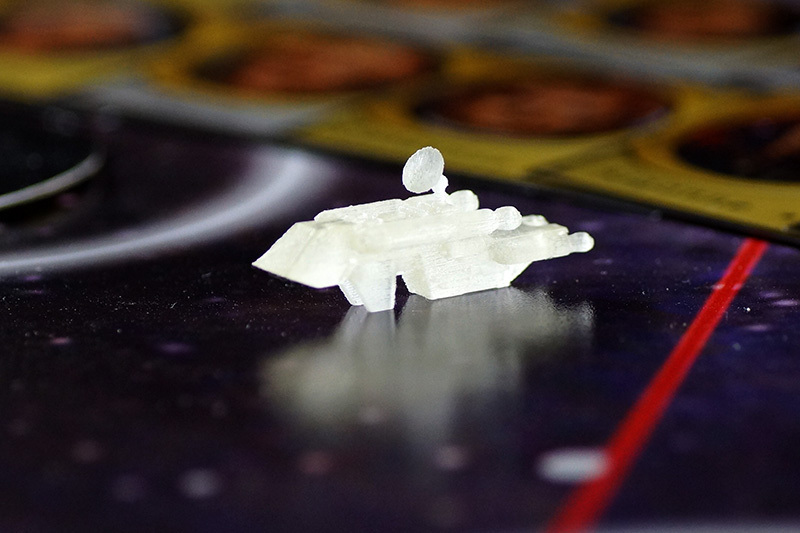 The ships don't have quite the detail and color of the larger pre-painted designs, but they are an easy way to bulk up your board game fleet. You can pick these up at Terran Fleet Supply. 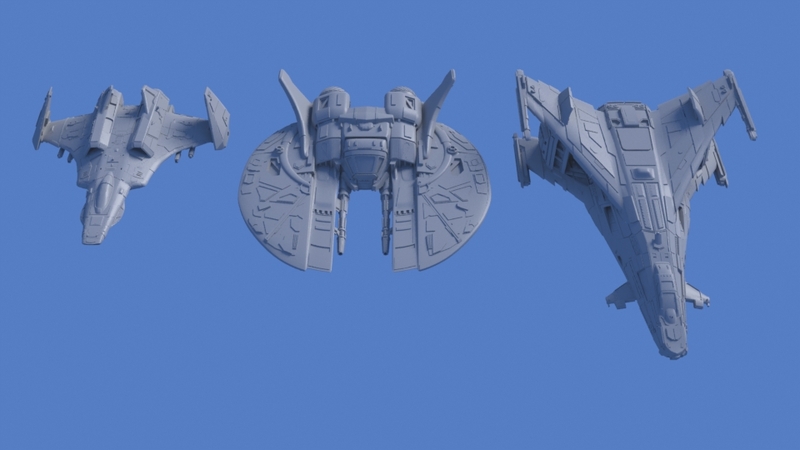 More ships of all sorts are on the way! We're now just three weeks away from the scheduled launch of Wing Commander on Blu-ray, and competition continues to push down prices. The stalwart Amazon has held steady at $12.99 so far, and they're still probably your best bet to get the disc on release day. Walmart, Barnes & Noble and Deep Discount have also posted lower prices at $12.96, $12.72 and $12.29 respectively. DVD Empire would seem to have the lowest position at $11.99, but Target has also come down to $12.29. After Red Card discount, this drops to just $11.68 with free shipping! Most places offer free shipping at $25 or more, but Target and Amazon will most likely be the cheapest/quickest. Not to be outdone by the states, Amazon.ca has lowered their number from $16.99 to $9.97! As fans' excitement rises with the approaching street date, there's one potential wrinkle. When we first learned of the BRD in May, it showed up in Walmart's listings with an August 13 release. 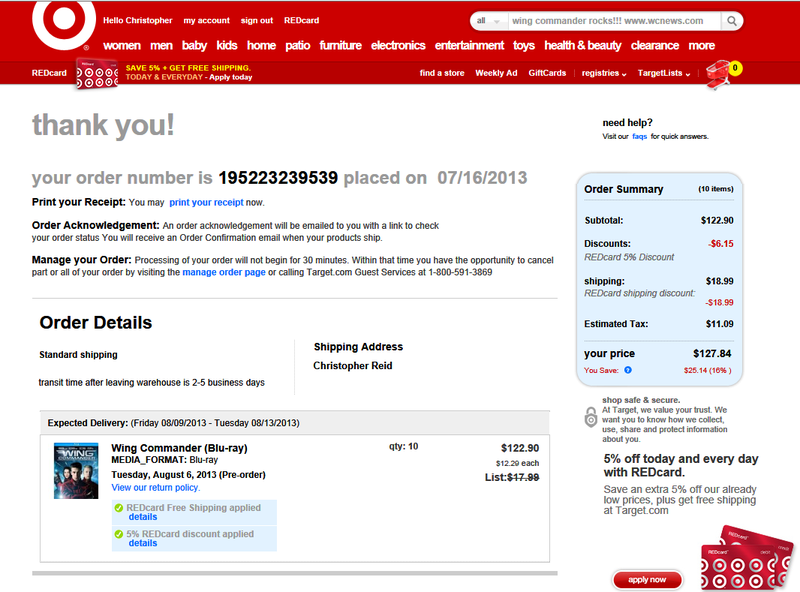 Virtually everywhere now shows an August 6 date, but Walmart has not changed. Publisher Anchor Bay has circulated a press release dated June 20 that highlights the six 20th Century Fox titles that they are shipping in August, and it still shows an August 13 street as well. We're still holding out for August 6, but don't be too disappointed if there ends up being a one week delay. One way or another, it'll be here soon enough! Here's yet another example of just how talented Wingnuts are. rivaledbynone saw the Excalibur parts kit that was recently put together by Chronical Guy and had to make one for himself! 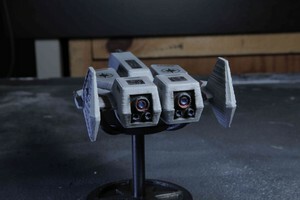 He picked up the materials at Shapeways and got right to building. 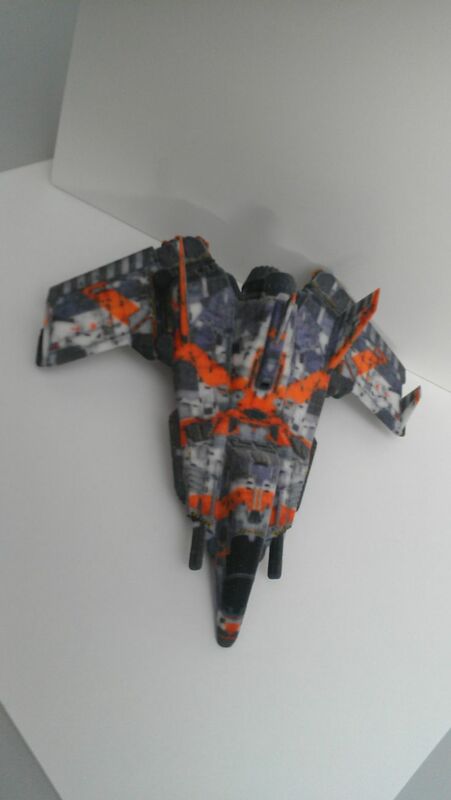 The model geometry is fantastic, but what really sets this particular specimen apart is the superb paint job. Check out the gorgeous pics below. 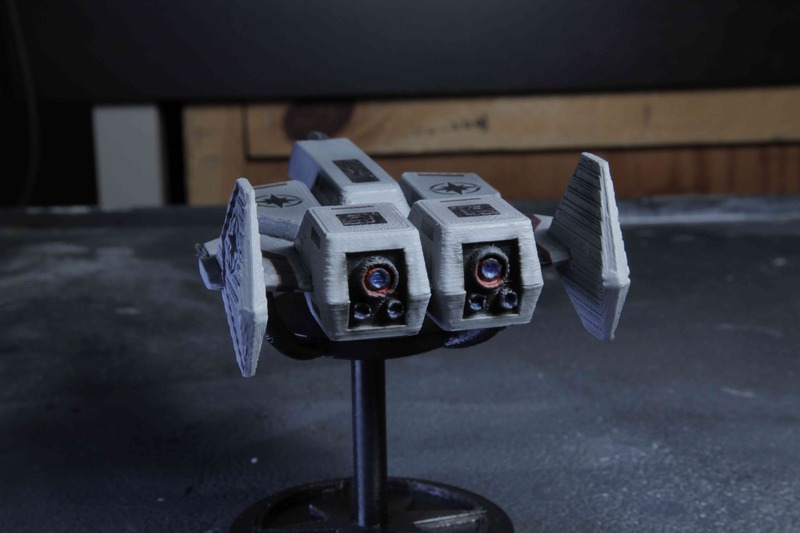 I love all the wonderful models that everyone has been producing. When Chronocidal Guy posted his Excalibur model for download on Shapeways, I knew I had to print it for myself and try to build it up like a store bought kit. 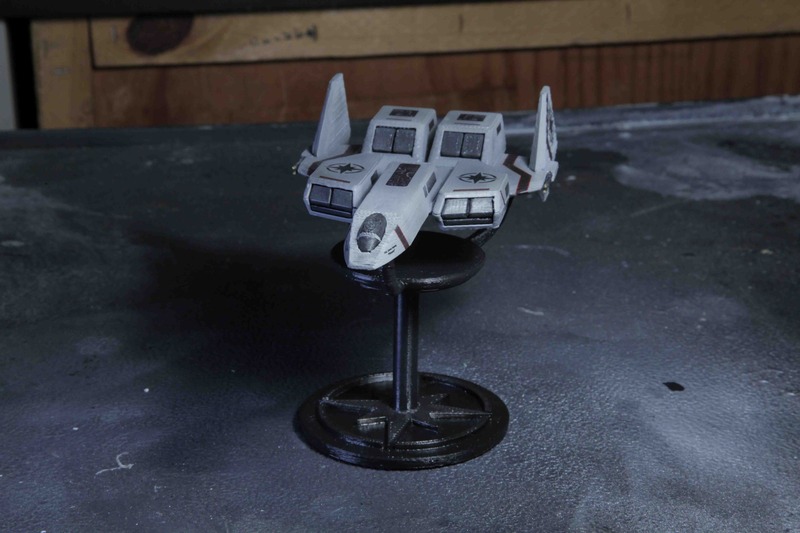 Klavs81's models are top notch (has to be mentioned), but there was something about Chronocidal's calling for me to build and paint it (part of it was that the .STL was available for free). 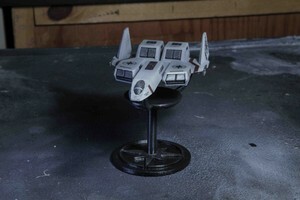 Plus the kit design let me make the model larger than my 5x5 inch table, which rocks. 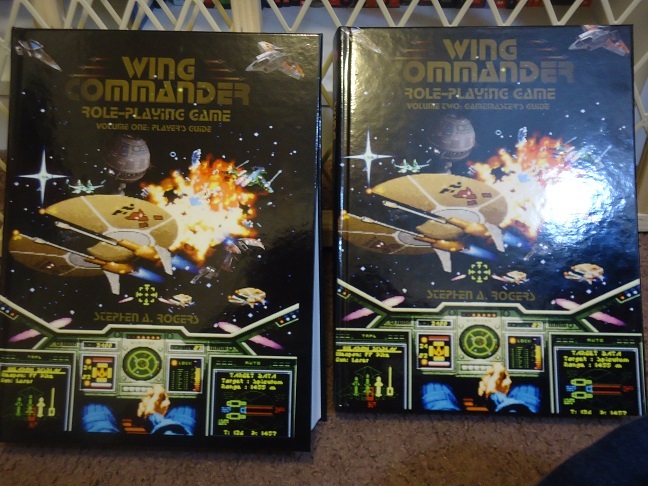 I figured it would make a great house warming gift for my brother, the only bigger Wing Commander Fan than myself I know in real life. I hope Chronocidal Guy, and the rest of you guys enjoy it. 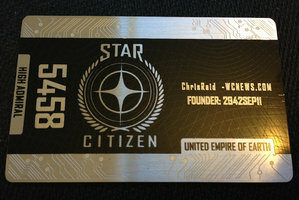 A shout out to you Chronocidal Guy, thank you for posting this ship. If you post an updated one with paneling, I will probably print and paint one of those up too. 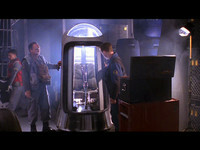 There's a new poll today that asks about the best room aboard the classic Wing Commander carrier. Each game has a slightly different set of available options, but there's a basic set that stands out. Which place was your favorite? 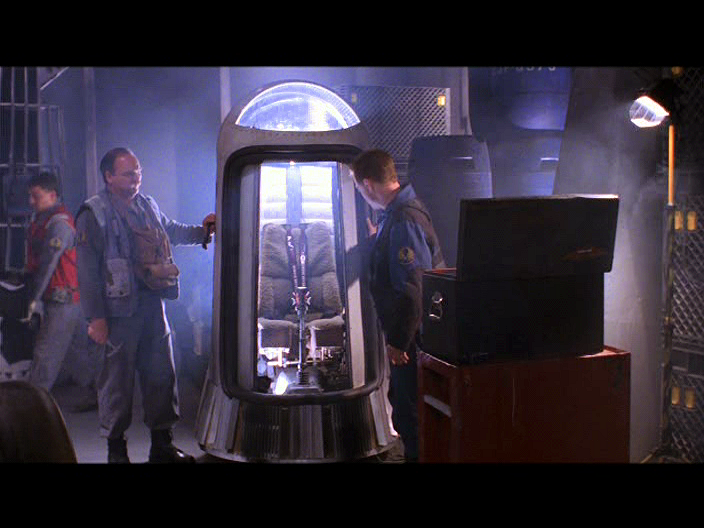 The old poll asked how long it'd been since you were back in the cockpit. The majority of Wingnuts seem like regular players, but a few of you out there seem to be stuck farming on Nephele! 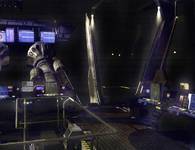 A brand new downloadable alpha build of the space sim Wings of St. Nazaire has been released! There are a bunch of improvements in this update relating to waves of enemies, their reaction to the player and a new external camera. 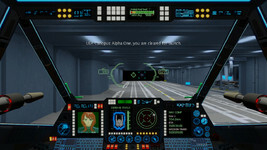 A Wing Commander-style cockpit joystick and throttle have also been added. 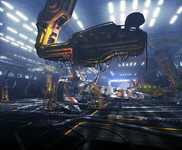 You can download the game and find out more here. 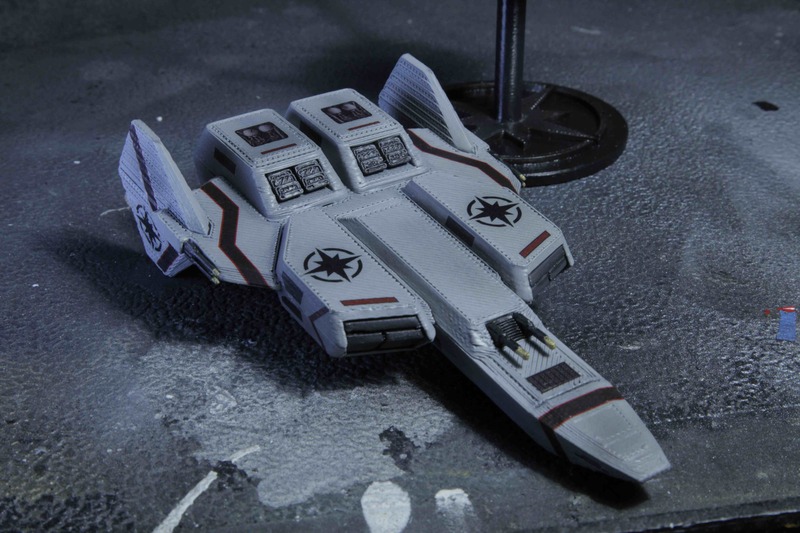 Wing Commander fan Howard Day is one of the artists for the game, and he's also set up a Shapeways site as a place to get 3D prints of the new models made for his game. 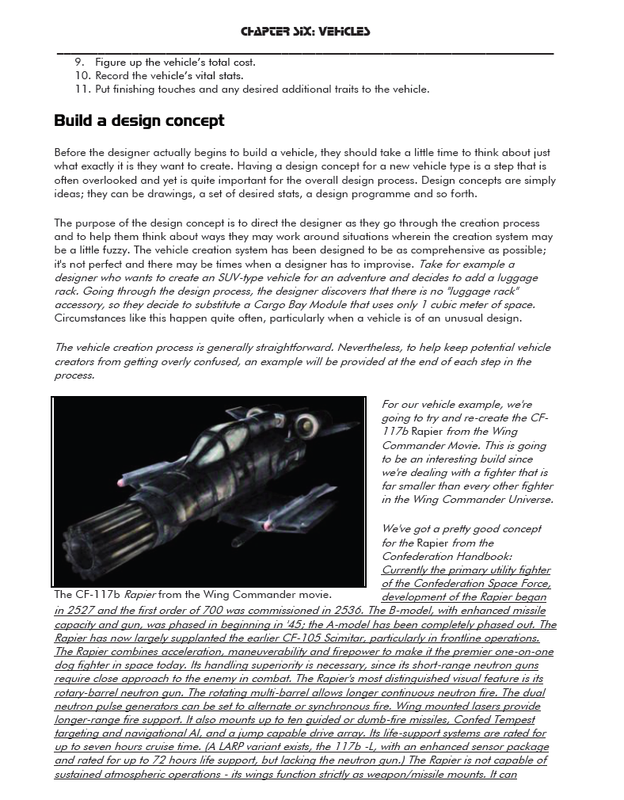 While I am well aware that none of my designs are anywhere near as iconic and awesome as the Wing Commander ones, I still thought it could be something people might want. They're right about the same cost as Klavs Fighters, and a good size (about 4.5 inches long). Four Weeks Until the Birthday Party! 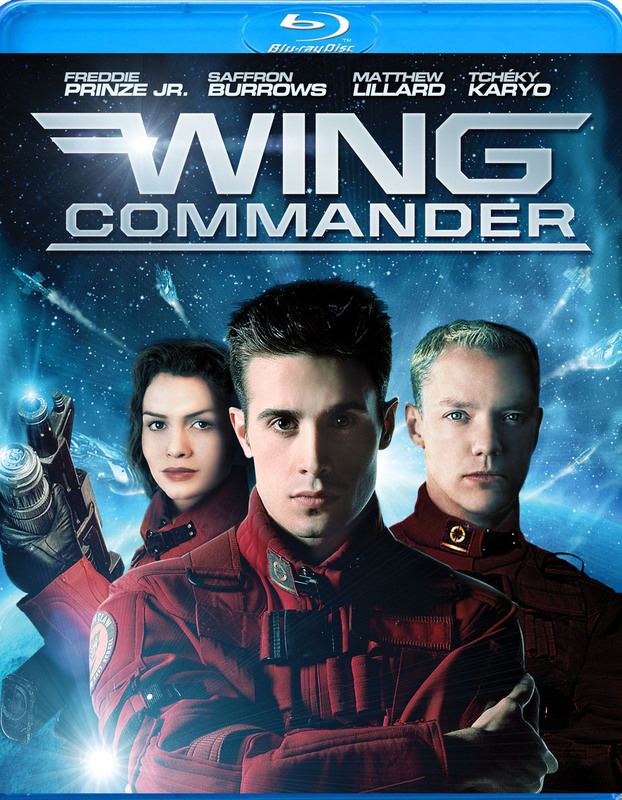 We're now just four weeks away from the Wing Commander CIC's 15th Birthday! Preparations are getting rolling in earnest, and we can't wait to party with you. 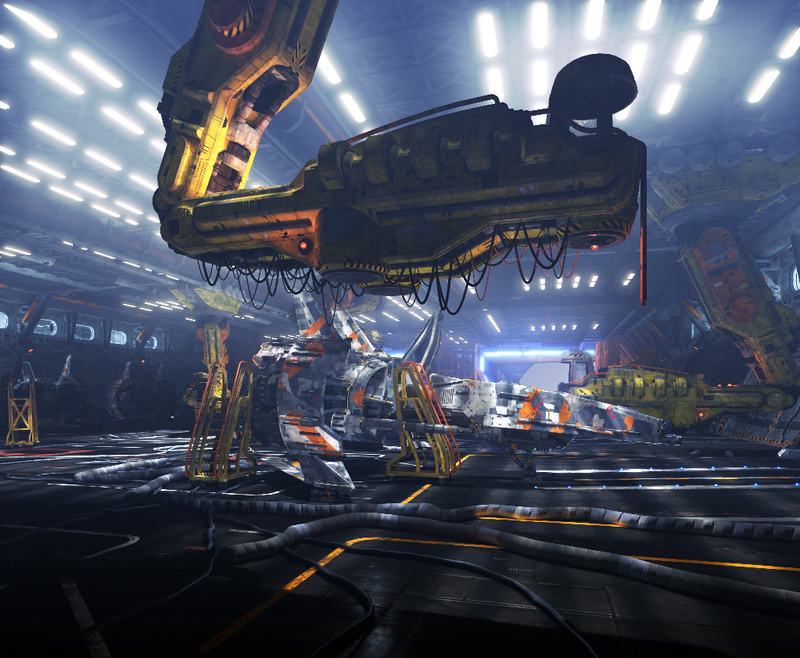 Everything comes to a head on Saturday, August 10, 2013 at 7:00 pm EDT (4:00 pm PDT and 11:00 pm GMT). Since the party straddles a weekend this year, we're excited that many of our Asian and Australians friends will be able to make it on Sunday morning. Festivities will be held in our IRC chatroom, #Wingnut. Newcomers can easily join through the web interface and start chatting right away. There'll be trivia contests, prizes and special CIC features! You can even RSVP and invite your friends via our Facebook page. While we're talking about the website, this is also a good opportunity to point out a few site improvements that have been implemented over the last few weeks. Like all the other cool websites out there, we've grabbed a shortened URL: http://wcne.ws Try it out, it works! Right now you'll see this pop up in our Twitter feed. 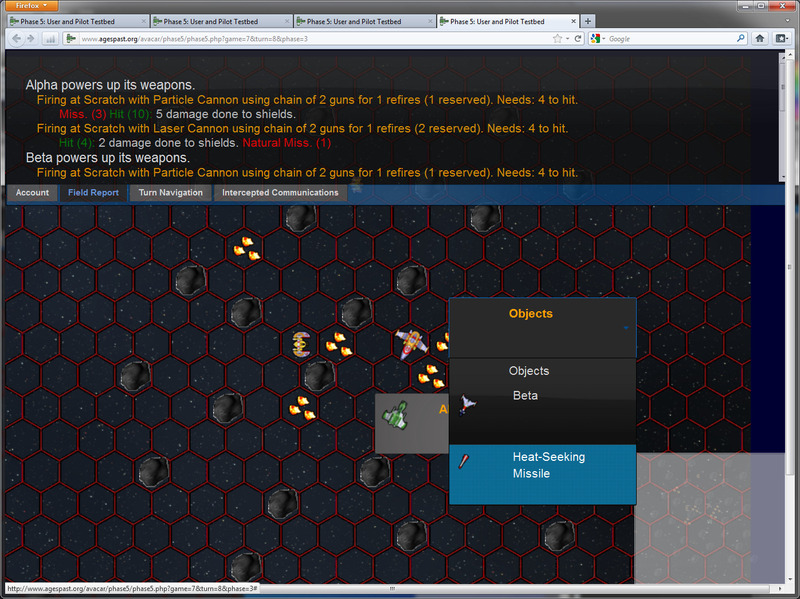 Our menu interface has also been tweaked. The red "News" flyout has been completely revamped into a "Resources" menu in order to provide quicker access to a variety of WCNews sections. 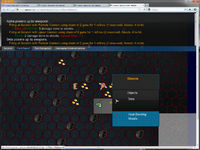 We'll continue to refine the menu system and improve the site layout as we go forward! Fans have been clamoring for new skins, and Klavs has obliged with a Wing Commander 4 variant of his popular Arrow 3D print. This ship joins versions of the design based on both Wing Commander 3 and Armada. It's a beautiful ship that's all set to represent the Strategic Readiness Agency on your behalf. Find it at Terran Fleet Supply! 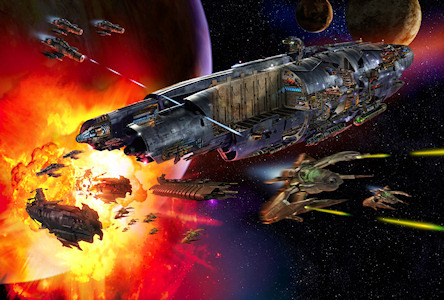 And then check out Maniac's recollections of the ship below. It had been six months since I had been in the cockpit. Surgery, rehabilitation, interviews, press junkets, endless memorial dedications, and a month long leave at my dad's place had taken their toll. You'd think the guy that helped dust Prince Thrakath and destroy Kilrah could fly a decent upwind leg but noooo. I was way behind the ship. Basic piloting is all about managing your finite amount of concentration into managable levels, and planning ahead to break your concentration up to manage the next thing. I was blowing it bad. Before I knew it I was blind with no NAV info, climbing through a solid overcast at 4600 meters with no outside reference or data. Normally this is no problem in an Arrow, if you go blind, you just pitch up, use your thrust to pop up above the overcast and start working on your options. But thanks to the new batch of fleet cutbacks we only had enough fuel for a short atmospheric hop, the engines mixing the limited fuel with the ambient air to maintain propulsion and there was no way I had enough propellant to burner up to the stratosphere. It was just supposed to be a local atmospheric flight. Red lights were coming on one after another, and now I was totally crippled and blind, with no way to know even my altitude. I had been shot at thousands of times, been shot up hundreds of times, and nothing shook me like that dark cloud closing in around me, the rivulets of water pouring over the canopy, the flash of lightning, the sound of my stupid beating heart, and me, cursing like an idiot at my own stupidity and pride. That green painted Arrow and I were going to dig one hell of a messy hole in the mountainside. Whistler found a cool website filled with carefully documented gameplay experiences. 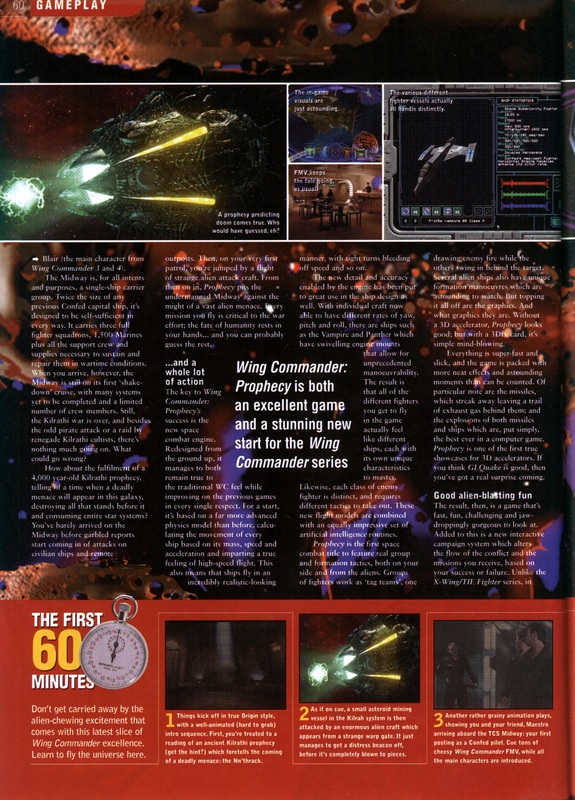 There are many different series profiled, including an extensive play-through of Wing Commander. ivantod spent the better part of a year going through Wing Commander 1 & 2 and all of their expansions. 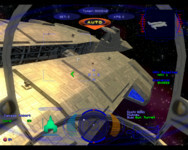 Over a hundred missions/entries were cataloged in all! 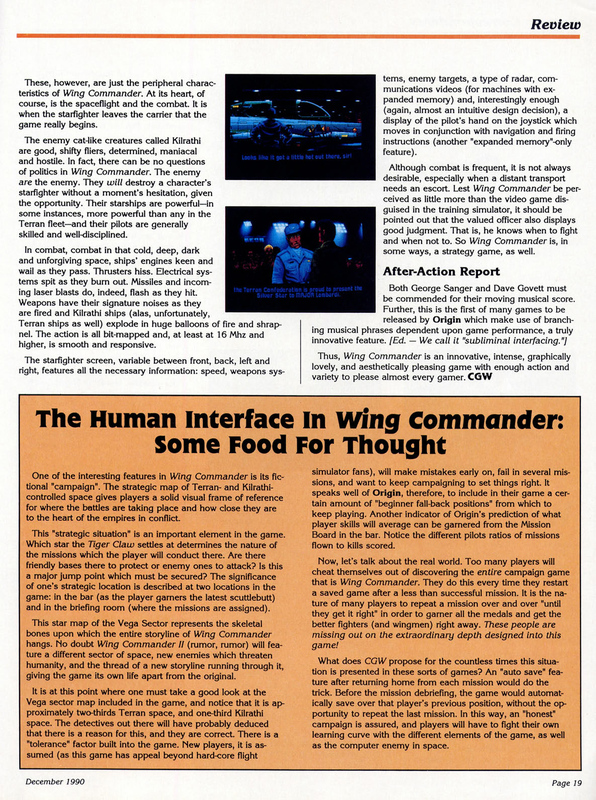 Story elements are also included with quotes and pictures, which is similar to the campaigns posted at Wedge's Wing Commander website. A particularly nice touch are the bonus items where the author finds relics such as the Japanese Claw Marks Vega Map and shares them with readers. The exploits remind us of the CIC's Community Replay conducted in 2008-09. 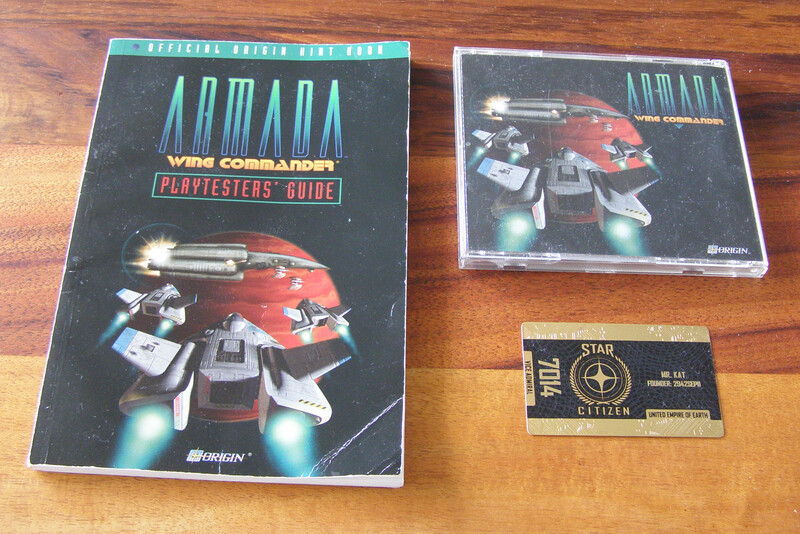 Check out the Let's Play Wing Commander feature and bookmark it for future reference! This was started back in August 13, 2010 and ran until May 31, 2011. Though there's a bit of personal review material it more-or-less qualifies as a walkthrough complete with screenshots of all the dialogue to video of his flights. A useful reference as long as it remains up. Winning path complete from Enyo to Ayer's Rock. He even made the Rostov detour for those of you who couldn't save that silly Ralari in Kurasawa. 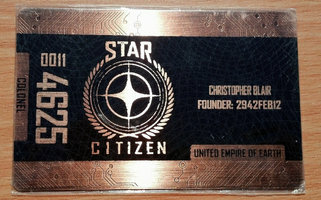 Stage 5 TV recently visited Chris Roberts to talk about Star Citizen, resulting in a ten-minute documentary video. The most interesting part for Wing Commander fans, however, isn't Chris' interview... it's a three second HD pan of his TCS Concordia model! 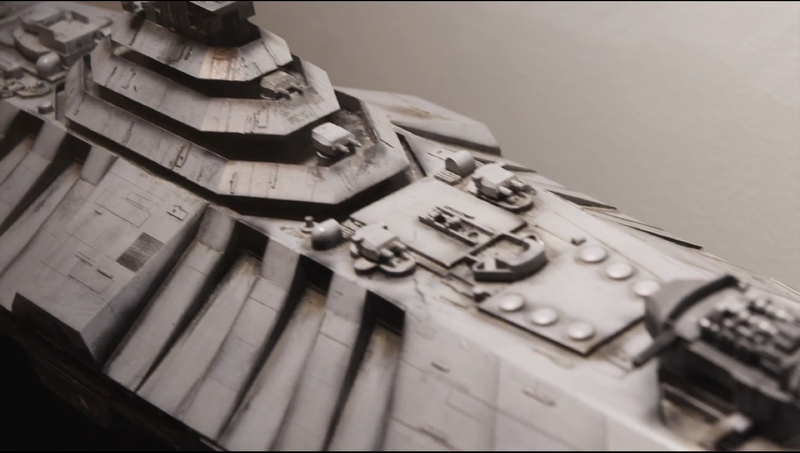 Used in the making of the Wing Commander movie, this model now decorates Roberts' Santa Monica office. Apparently confusing the ship for a model of Star Citizen's Bengal carrier, the Stage 5 team provided a great closeup view of the ship, giving Wing Commander fans a never-before-seen detailed view of the powerful supercruiser. 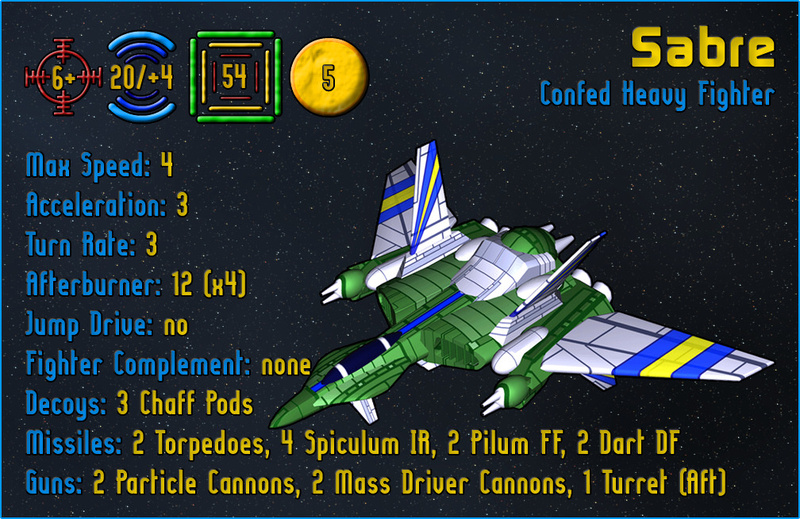 Avacar popped in to give a little status update on the next big update to the online version of Wing Commander Tactical Operations. 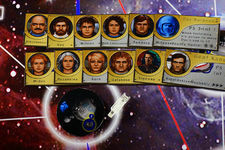 He'll soon be making a push on the game's scenario editor, which will allow fans to manage their own player campaigns. There will be some pretty cool features in this update! 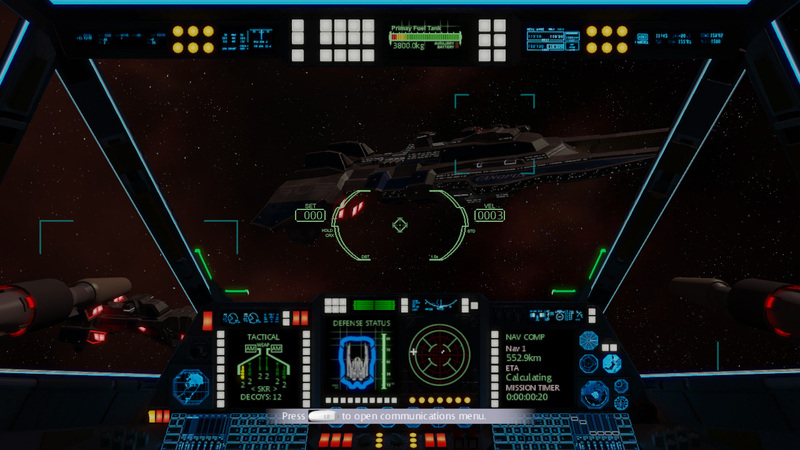 When everything is complete, Avacar plans to allow game masters to create games, edit ships in play and otherwise run multiplayer battles with a custom built user interface. It's great to see improvements still being made after several years! I'm only days away from finishing my PhD finally IRL. My plan has secretly always been to spend some more time on TacOps development this summer. I can't recall how much I mentioned last fall when I last worked on it, but I am about 1/4 of the way through the scenario editing abilities. I plan to finish that off this summer, so you guys can start running your own games. I'll probably stay fairly quiet in the short term, but then announce when the next major Phase update happens. 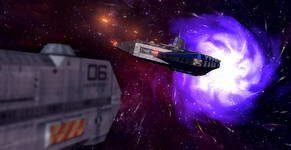 The Maslas Brothers have released the first teaser video for their fan project, Wing Commander Flat Universe. 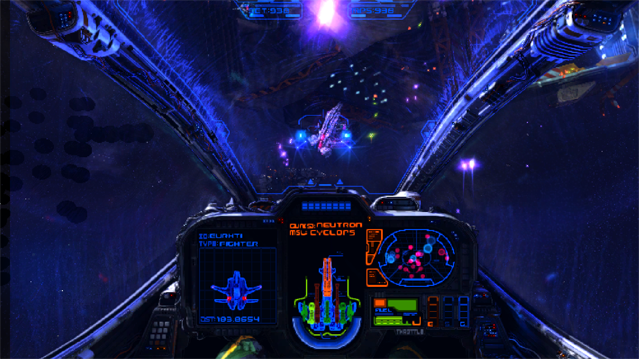 The clip shows several playable ships dogfighting between each side's destroyers. 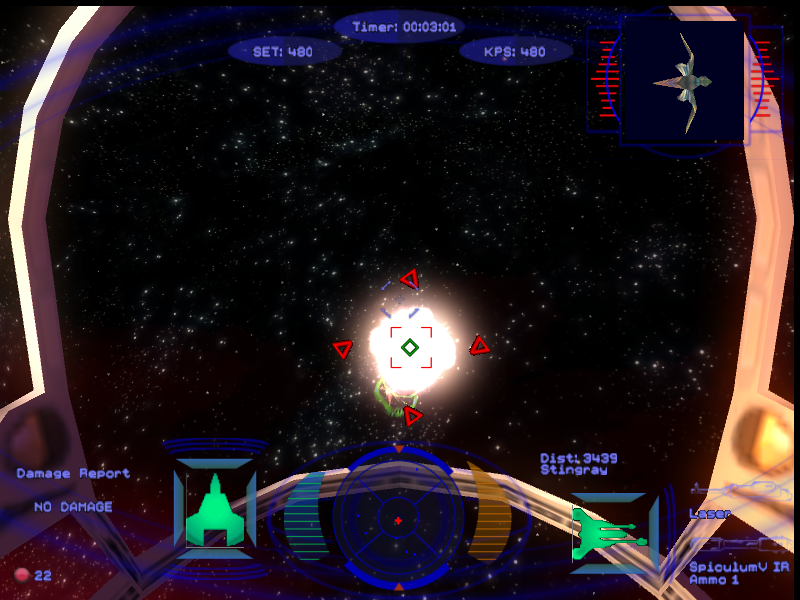 Howard's models look excellent in their engine, and familiar items like the targeting cursor are a wonderful touch. The duo is also working on a website that will summarize information on the game and provide more photo and video updates. The game can't come soon enough! I hope that everyone likes these first scenes and I am pretty sure that each of you might want to know more about the progress of this project. Believe us when we say: "There is more to come!" Everyone have fun and wings high. 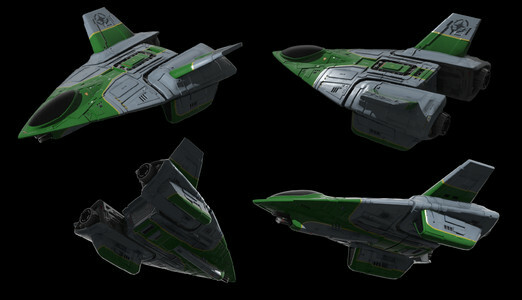 The Excalibur now has a hotshot cousin at Terran Fleet Supply. 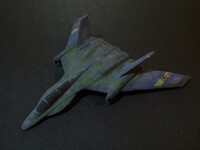 Klavs has completed the textures for the fantastic model that we first saw about a month ago. 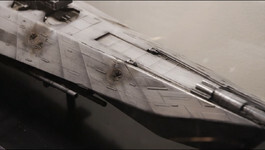 The red streaks on wing and fin leading edges are especially sharpm, and the ship even includes the underslung Mace Missile. Due to the relatively modest size of the Morningstar, the price of the 3D print is pretty low at about $18. 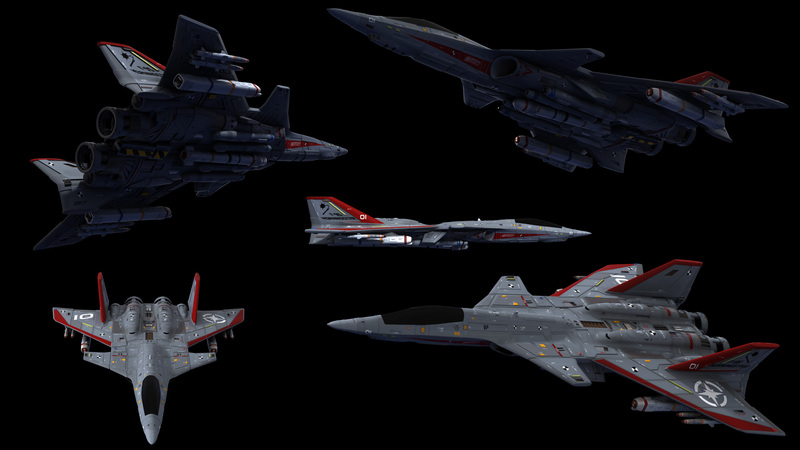 Klavs also put together a nice side-by-side to show how the F-95 and F-103 compare. They're a couple of real beauties! 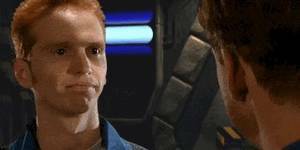 The first humans to create and test a useable "jump drive" based on the 23rd century work of Dr. Shari Akwende was not the Confederation. 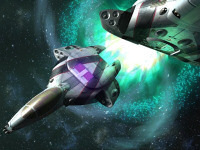 The Pilgrims, a group of human separatists with genetic mutations that enhanced their ability to navigate in deep space, first tested an Akwende drive on 2501.187. They kept their discovery secret from the Confederation government for eighty-seven years. The Confederation first tested a working drive on the Haile Selassie. 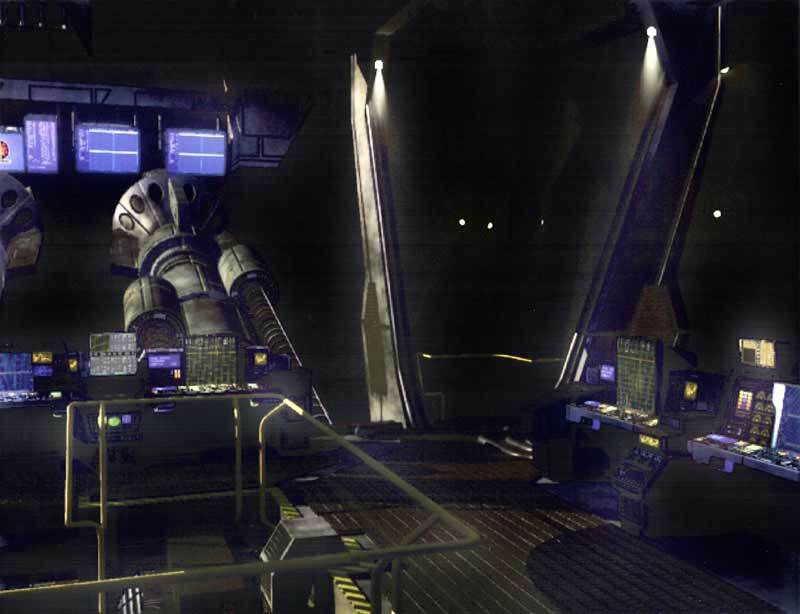 She jumped from Sol to Polaris on 2588.315 and returned on .323.
sndwv has been following all the latest advances in 3D printing, but he's also come to find a new appreciation for some of the pioneering attempts from a couple years ago. He's recently ordered these "vintage" designs from 2010 and 2011, and they hold up very well. 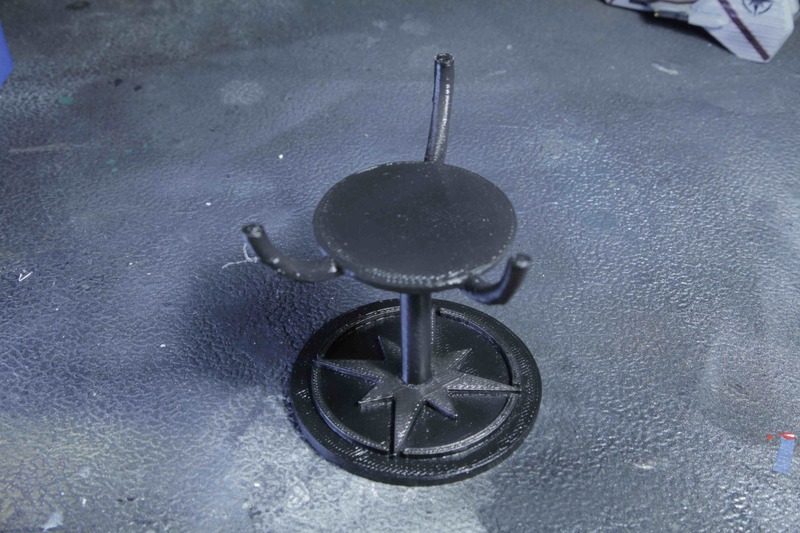 Here's is one of Dream Foundry's Excaliburs printed in glossy sterling silver. The price and material constraints limit your options to smaller, lower-detailed ships, but I think it looks absolutely amazing. I have a couple of other 'experiments' on the way in plated stainless steel, which is cheaper but also much less detailed. Attached are pics of three of Atropos907' s carriers in gloss gold and bronze plated stainless steel. 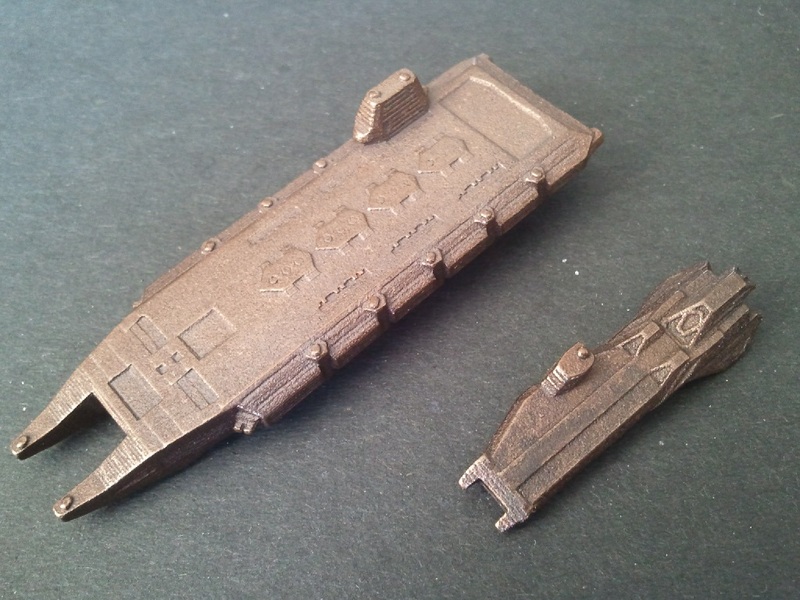 Wouldn't recommend the gold color (matter of taste), but overall detail is quite good (excepting small details like gun turrets), smoother in person, and esp. the bronze ships look really nice, exactly the 'desk model'-look I was aiming for. Will probably mount these on a small wooden display stand. Astro Commander's Wing Commander prototypes are still available at the Dream Foundry. 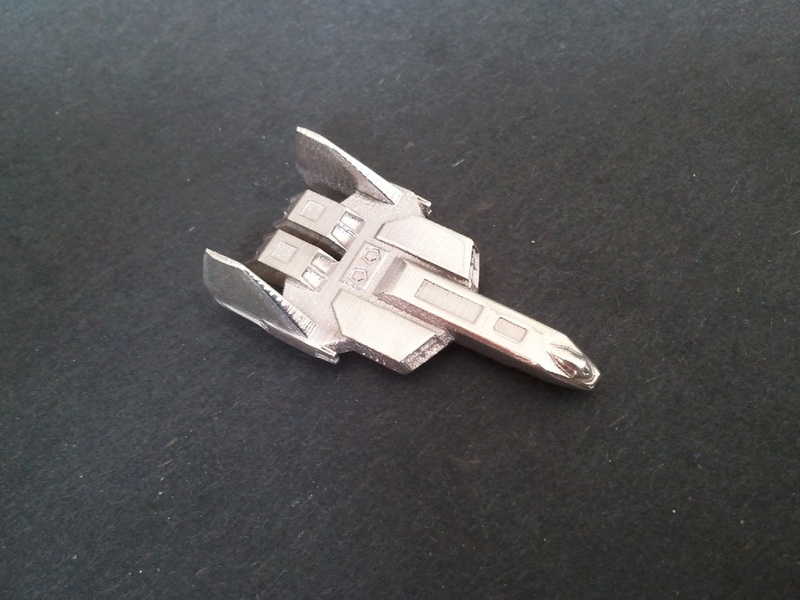 Most of the fighters are about the size of a coin, although the capships are a bit bigger. They're also unpainted, although a few different options for component material are available. 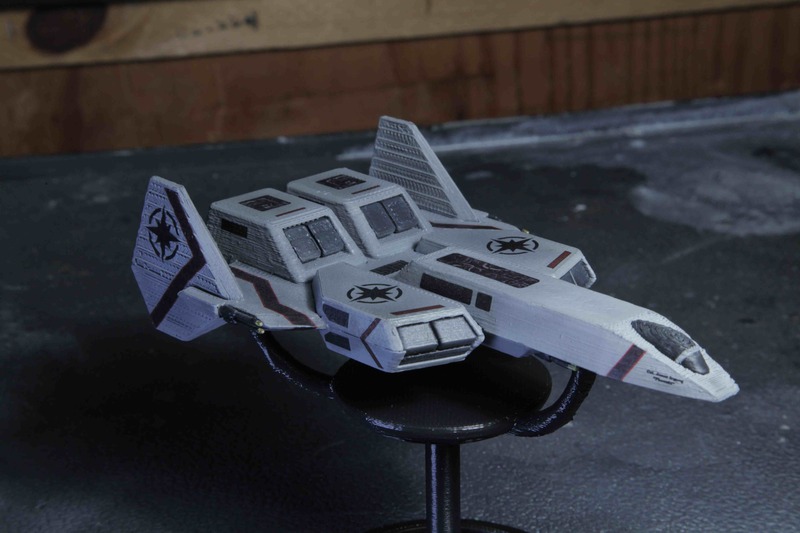 But if you've got some talent with a brush, these models make an absolutely fantastic fleet for large scale tabletop gaming. You can check out some photos of these ships in action here. Happy 4th of July to our Wingnut visitors from the United States. Most of us are taking it easy today, but we hope all of you out there worldwide are happy and safe. 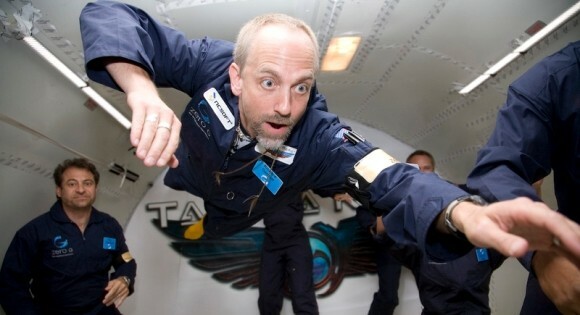 Today is also Origin founder Richard Garriott's birthday. Happy 52nd to you sir! 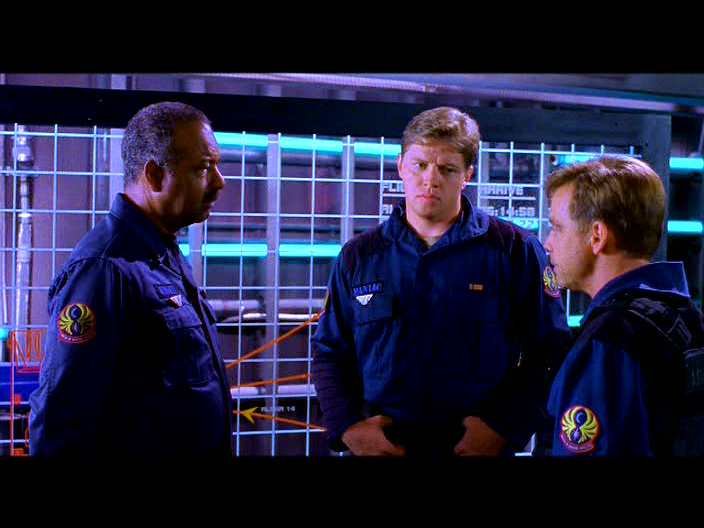 Back to more Wing Commandering tomorrow! We posted quite a few pictures of the sunken Concordia earlier this week, but we still managed to miss one! This particular image is just too gorgeous not to share, and it's only been seen by a limited audience to date. 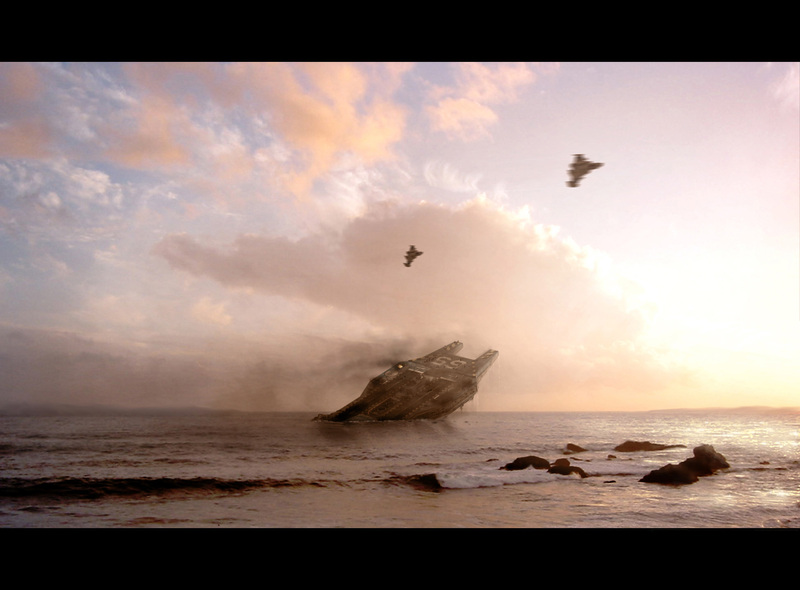 "Mistral Coast" was created a while back by Klavs. It features a pair of his original Rapier designs scouting a less harsh looking sky. And even though this one is some years old, it'll still designed to fill your 1920x wide monitor. Time for a wallpaper change! Even though that one is pretty old it's one of my favorites! jlav has some new art to share for his Privateer Board Game project. The first shots reveal some of the new physical items, which include a 3D printed Tarsus and some character cards. 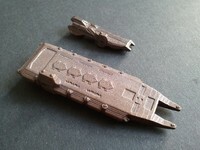 Different materials are still being tested for the miniature ship, but the plan is to eventually make it available on Shapeways. It sounds like there's quite a bit of tweaking to go yet, but what we see here already looks pretty sharp. You can download and try out a test release of the online digital version here! Working with some of the original 3d models, as well as some of my own interpretations, opens up the door for actual models for the game. I've just ordered 4 different materials, to see what I like best. 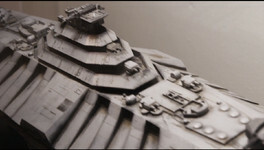 I hope to have all of the ships up, as well as a basic ship set for people interested in playing with models from the game. 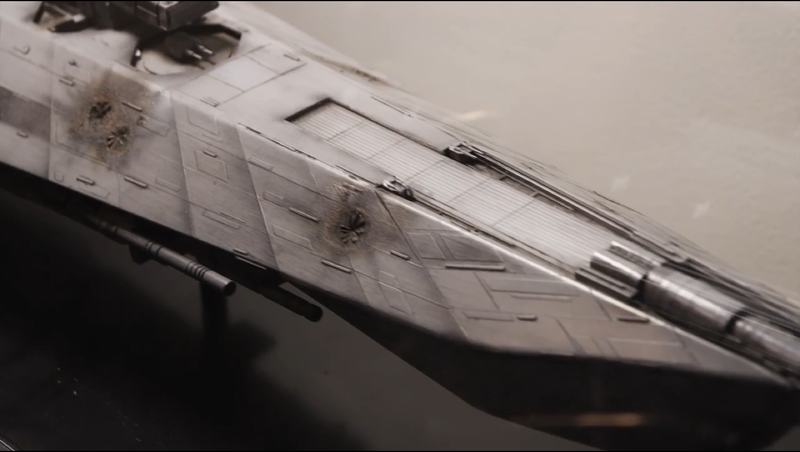 Damn, That's a Good Looking Ship! 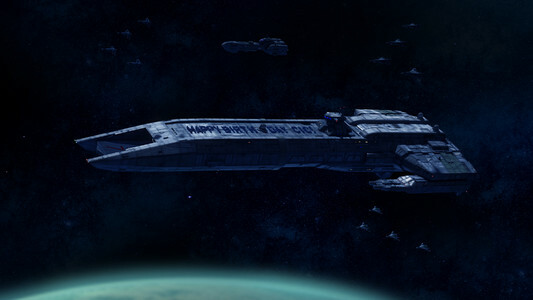 This time Klavs has outdone himself in creating one of my favorite ships, the Excalibur! 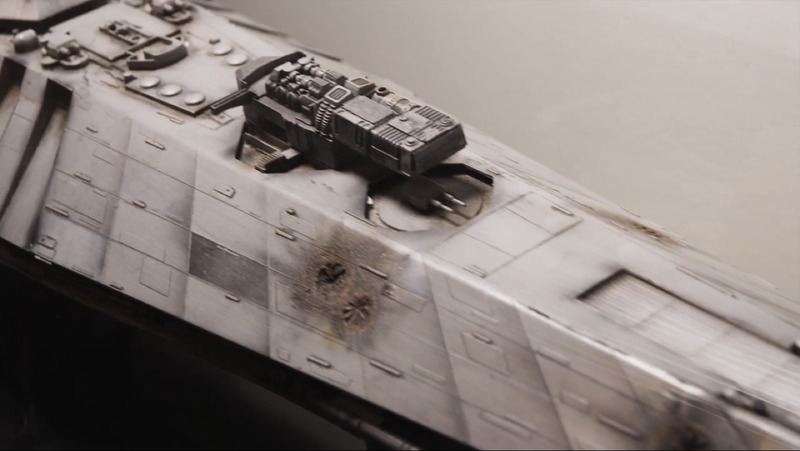 This particular craft has been modeled by many people in the community over the years, and today's latest example is one of the finest we've seen yet. And it doesn't just exist on your monitor! 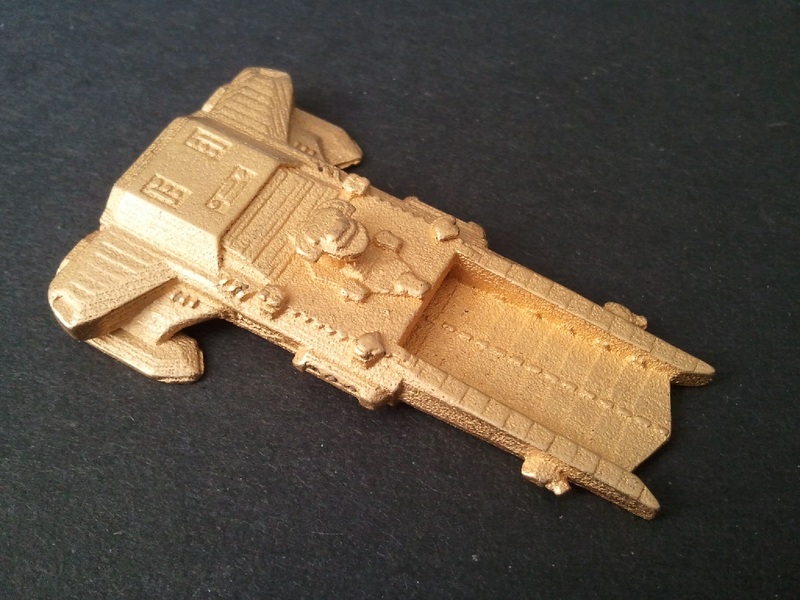 The F-103 3D print is available now at Terran Fleet Supply! Two versions are available: one is larger and to scale with most of Klavs' other fighters, and another is a cheaper and smaller variant that is similar in actual size to the other ships. Check out the excerpt from Maniac's autobiography below and then grab one for your fleet! F-103 Excalibur 'Lancelot 300' is now on permanent display in the Victory Museum, Jupiter Orbit, Sol System. 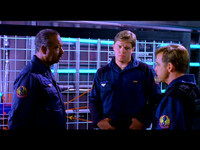 Chief Coriolis' crew back on the Victory had worked hundreds of hours getting our ships ready for the mission. 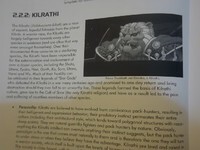 But the Excaliburs had seen some hard use in getting us all the way to Kilrah's front porch, and they were finicky to maintain under the best of conditions. The asteroid bases were reasonably well stocked, but they had been seeded before the Excalibur had fully left the drawing board. Some of the bleeding edge tech that gave the F-103 such an edge in space gave it a major Achilles heel when it came to the supply chain. Peters had pulled a main stabilizer quad from 300. She frowned at it for a minute, then strode purposefully toward the parts cage. After a few minutes more, I noticed her back under her own ship, 303. The deck was cramped, Flint had to come right past where I was working to get over to 300 again. We locked eyes as she went past. She was lugging the good stabilizer quad from her own ship over to Blair's. He saw what was going on, you could see it in his face. But to broach the subject was unthinkable, even impossible. 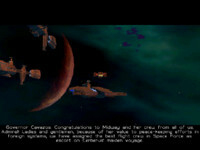 Despite everything, it was Chris Blair who had the best chance of completing the mission. The rest of us had become expendable. It was neither a hard decision nor an easy one. It was simply the decision that had to be made. I followed Flint's lead, no orders or discussion required. Soon we were working side by side, wordlessly pulling good parts from our birds to keep Blair's in top condition. 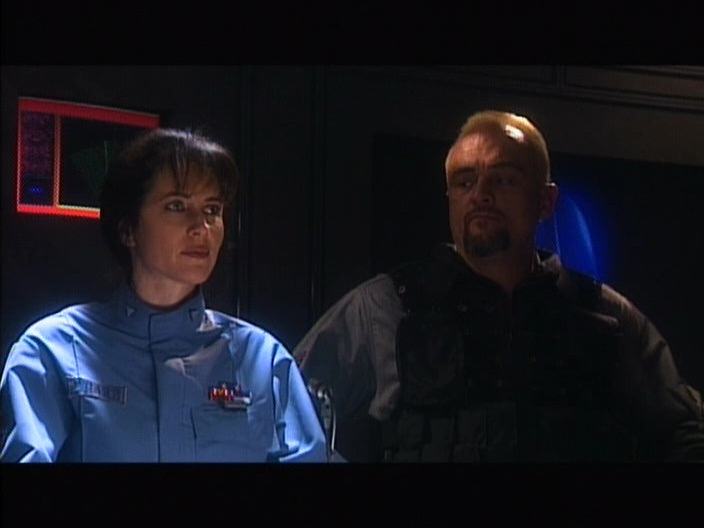 I can still see her: Filthy flight suit, face oily and grungy, hair greasy and matted, dark circles under her eyes. I'd have married that girl.